Well hello there. If you thought our blog was dead for good, I can’t blame you. In my last post I told everyone to “check back in a few weeks” – I think I missed that deadline by a couple days or three. I could just blame documentation again, but I won’t. In any event, since none of our millions of fans noticed that we had been silent for quite a long while, we concluded that the world possibly doesn’t revolve around us (although evidence is still inconclusive). Some say, better late than never, and we shall stick to that for now. so we still owe you a summary of the 2016 Rallye Monte Carlo. This was brought up by the fact that we will actually be leaving for the 2017 edition in just a few days! In any event, let’s talk about last year first. 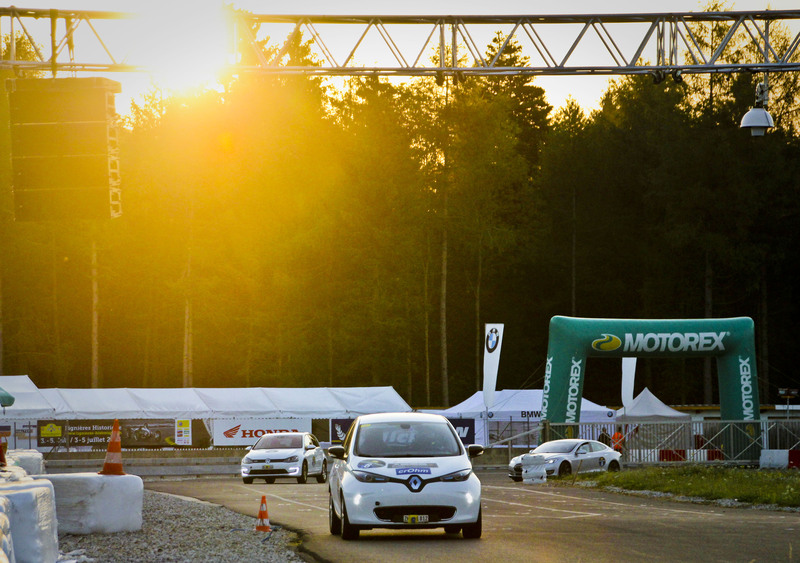 This rallye, while being for electric cars, is the real deal. 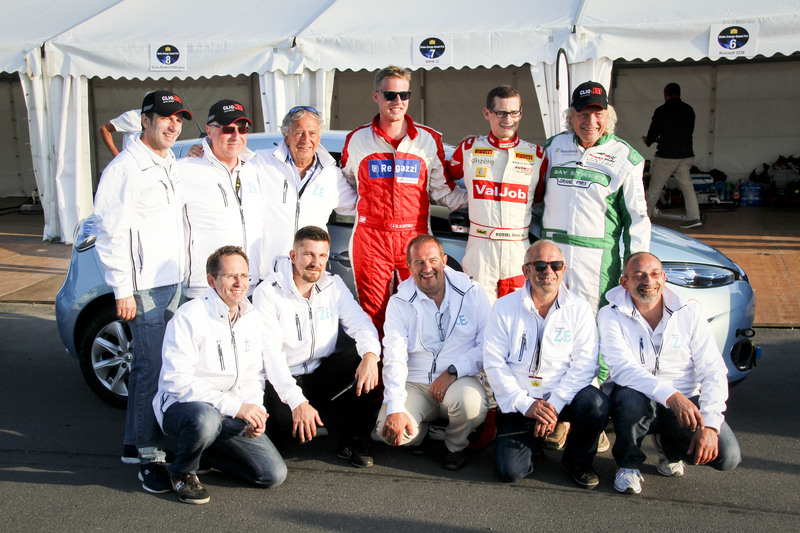 It is FIA approved, organized by the emerited Automobile Club de Monaco and offers real challenges in the form of a regularity contest – with a subsequent ranking. We subscribed rather late, it was a spur of the moment thing. We didn’t really know what we got ourselves into but as usual, we’d just let it flow and see what happens. Our first task the morning of the first day was to cover our car with stickers, followed by the inspection of said sticker coverage. Incidentally, they also checked that our car was road legal and equipped according to rallye regulations. The cars were assembled in the Cour d’Honneur of the Chateau de Fontainebleau, a wonderful venue; even the weather was perfect! The field was rather mixed, pretty much every common EV was present. 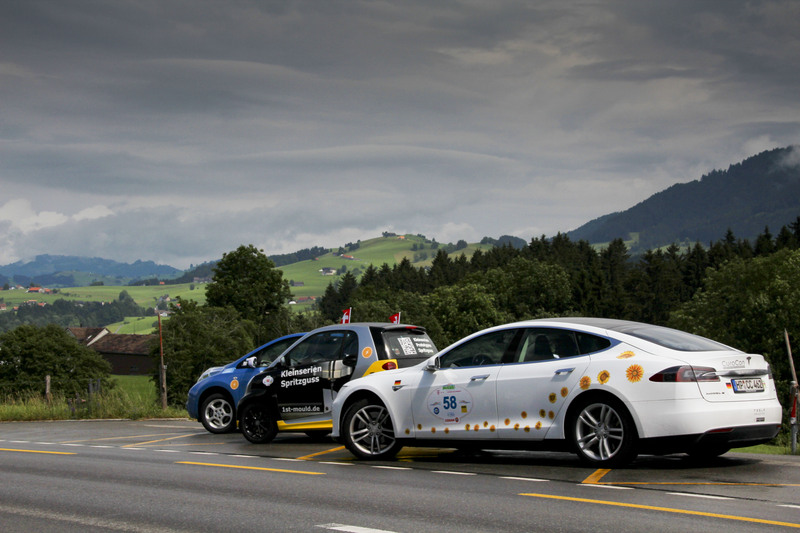 We ourselves had chosen to participate in a Nissan Leaf, even though we would have the possibility to use David’s Tesla. But where’s the challenge in that? 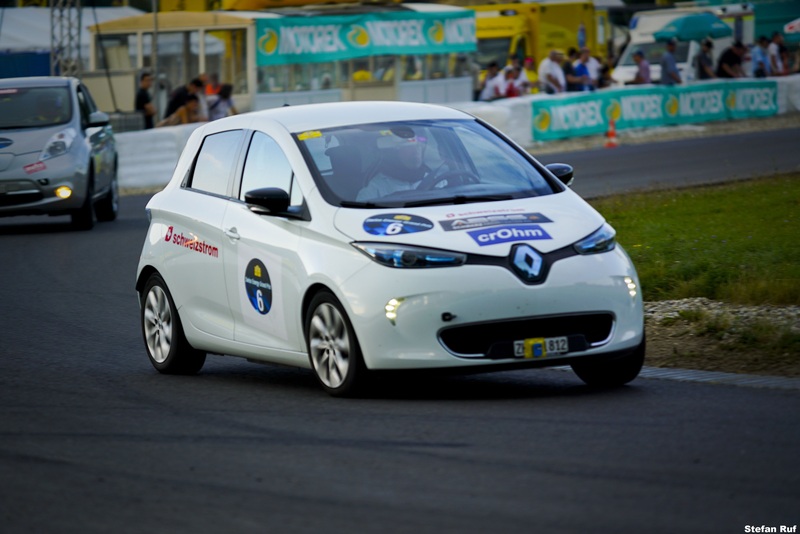 Most noticeably, aside from a few Kangoo F-Cells, Renault was present with an official team entering four Renault Zoé’s. Also unusual was the fact that three Toyota Mirai were present, a pure hydrogen fuel cell vehicle. 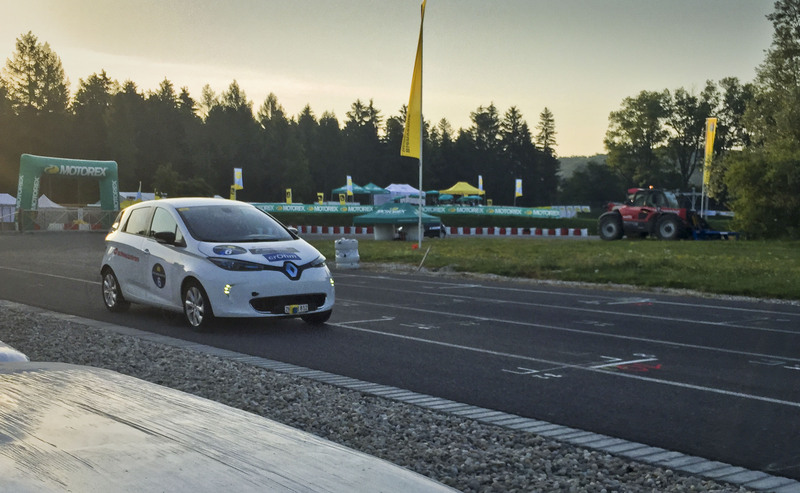 The first car to go over the starting line was a Toyota Mirai. The automobile version of BYOB. 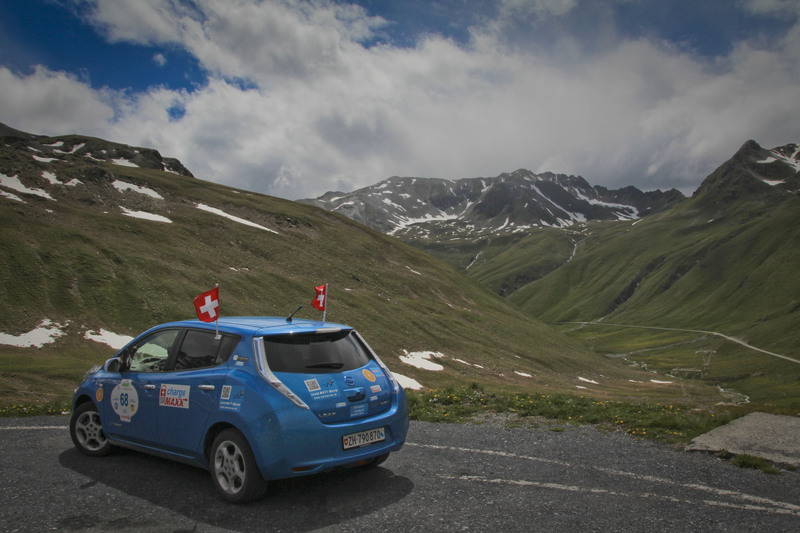 One of the sponsors being Air Liquide, their sponsorship consisted of providing participants with hydrogen gas along all along the Rallye. 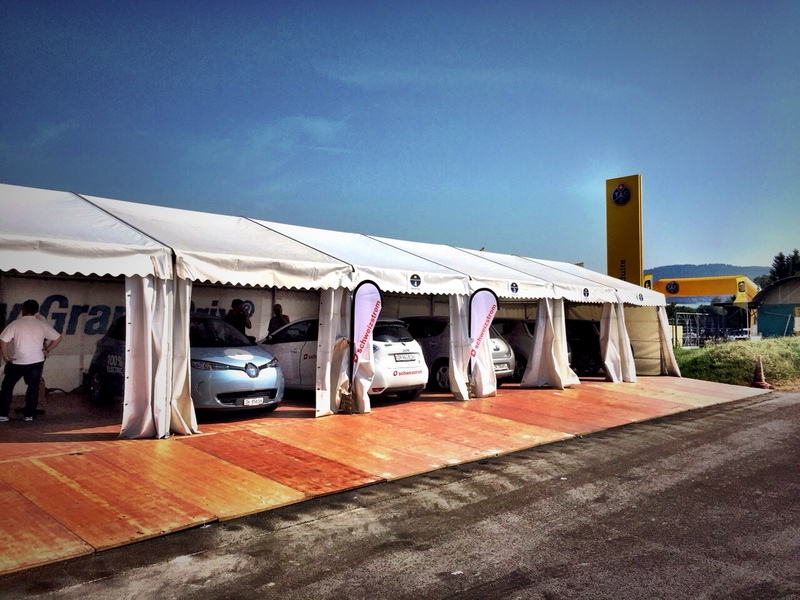 So you could say the hydrogen cars brought along their filling station wherever they went. Quite convenient, isn’t it? 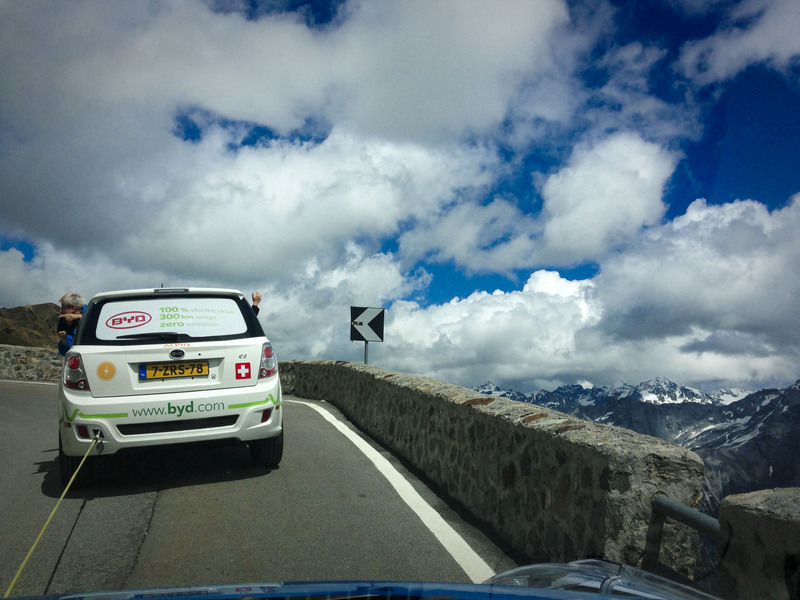 The first leg of the rallye took us across France from north to south. A lot of time was allocated for that distance, which led to the fact that this wasn’t really a challenge for teams with more experience (I’m not gonna say any names). First car on site. Guess who? After a night spent in Alès (under torrential rain, unfortunately) we prepared for the first stage – two laps on the track in Alès. Now if you google the Alès track you find lots of beautiful pictures showing a perfectly good racetrack. However, as we were soon to find out, we did not compete on the regular track but on the hilltrack seen on the lower right part of the picture above. This might sound like a downer at first but the steep ups and downs and tight corners made this much more of a challenge than a “regular” track would have. 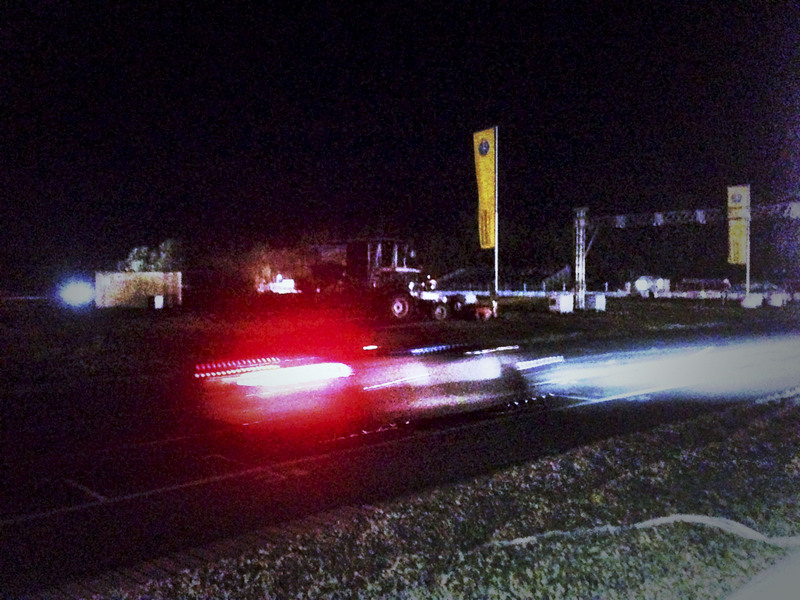 In any event we completed our two laps and drove off to find the starting point of the next stage. 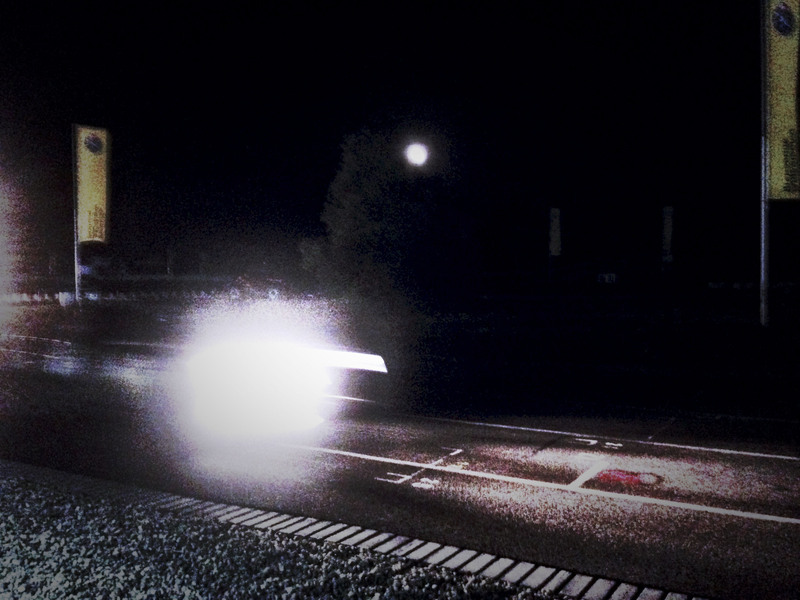 As it was the case for the first bit of driving, charging stops were involved, but nothing out of the ordinary. Somehow we managed to always find our chargers to be free, despite our fear that there would be much intereference with other rallye participants. This itinerary would take us from Alès (A) to Monaco (H), whereas the bits in between describe the regularity stages we had to attend (B-C, D-E and F-G). 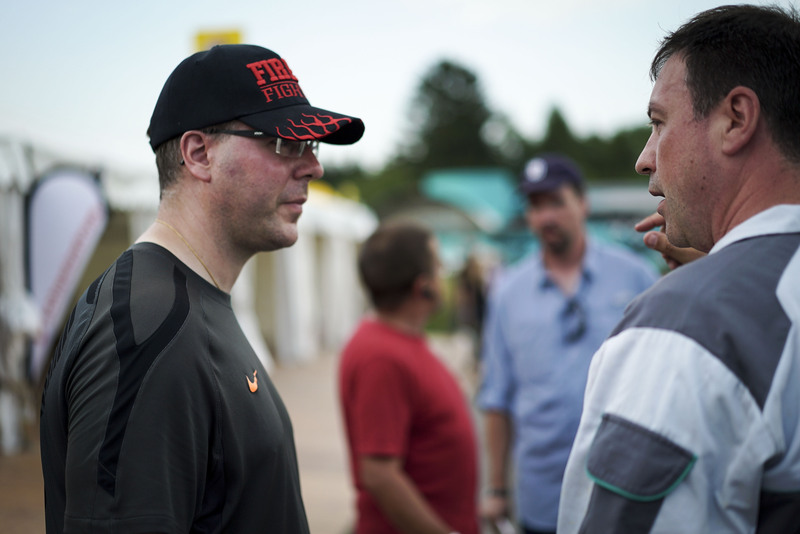 Unfortunately, we were both very busy during those stages – for understandable reasons – so there aren’t many picures around to show. 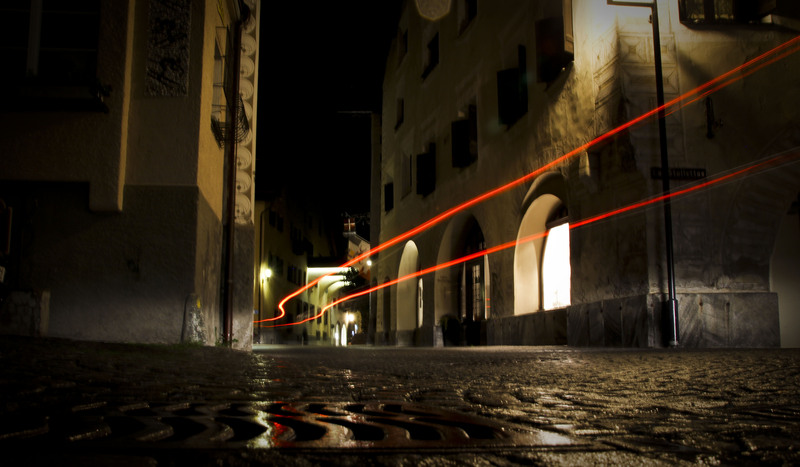 But just imagine narrow roads with tight corners, in the dark, trying to dodge hogs and hares while trying to maintain a certain average speed at all times. All three stages were around 20 km long, with ups and downs, crossroads and traffic. If you don’t think this is a challenge, well let me assure you it is. We crashed into our hotel beds (not literally) around 2 am and slept like babies. 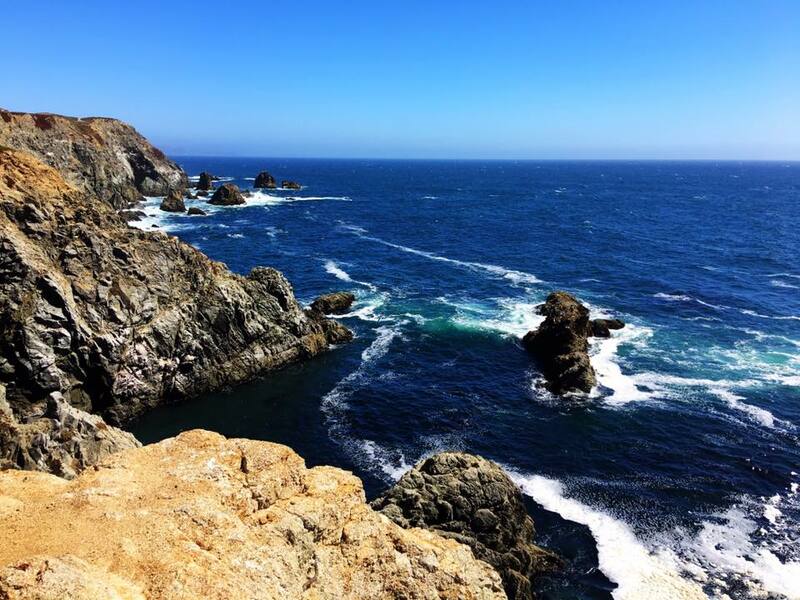 The upcoming day began in a relaxed fashion since there was time for breakfast and a leisurely drive along the coast. We did enjoy our day, since the weather had taken a turn for the better again, and arrived in Monaco in the middle of the afternoon. We explored Monaco for the rest of the day, pretending that we weren’t nervous. Because the most difficult stage was still ahead of us: The legendary Col de Turini was up for the final stage! 130 km of small backwater roads in the french alps, to be covered in three hours with three regularity stages in between! We knew this was to be a big night and we were really looking forward to it. We were going to drive across the Turini at night during a Rallye Monte Carlo, it hardly gets better than this for an average nobody like myself. The departure took place in front of the Automobile Club clubhouse, smack in the middle of Monte Carlo. There were lots of people around, and we were handed some finger food and an alcohol free drink. Then, we went off. Then, problems started. 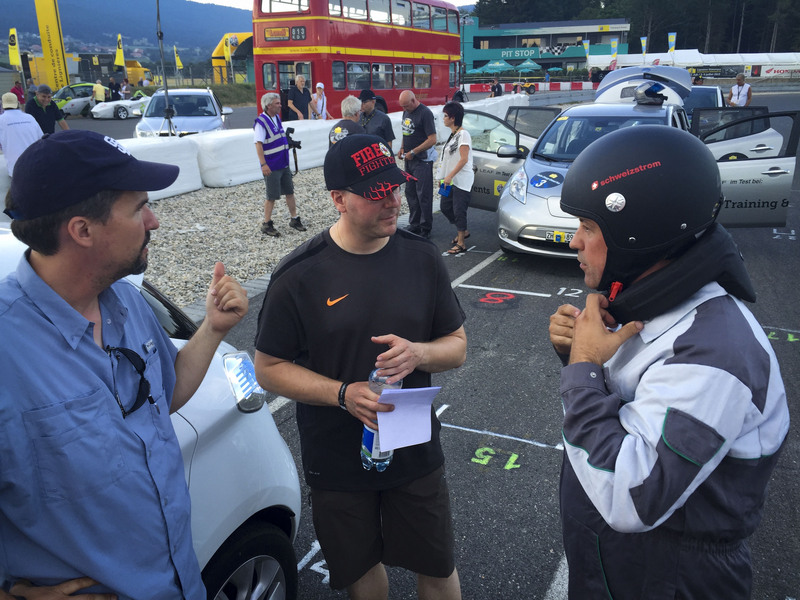 I could not find the proper itinerary based on the roadbook – mind you, it was handed to me on the starting line. we went back past the clubhouse twice to re-initialize our trip counter and find our way to no avail. Why is this important? Because if you deviate from the defined route, you were to be penalized with 1800 points, which we didn’t want but ended up to be anyway (spoiler alert). After a while I found back into the itinerary description and we found the regularity stages without any problems – if it wasn’ for the fact that I got really sick… I shouldn’t have hat that drink back at the starting line! ugh. Despite all that, we managed to get through the night without any major accidents, both vehicular and personal, and arrived back in Monaco around 2:30 am, being handed another 1800 points because we were more than half an hour late with respect to our predefined return time. This was due to the fact that we had driven back and forth across Monte Carlo to find the right way. We completely misjudged the time required to cover the rest of the stage. In any event, thanks to instant ranking and the internet, we quickly found out we were ranked as 22nd, which wasn’t much of a surprise given the penalties we had collected. A small consolation was the fact that almost everyone considered the roadbook confusing and all but a handful of cars were penalized that last day, and 22nd out of 36 isn’t half bad for first timers. The event closed on Sunday with a Gala Lunch at the clubhouse – where our rank was confirmed on the official announcement board. When the rankings were announced, we applauded the first three teams – until we were called on stage. Much to our suprise, we ended up receiving a trophy because we had beaten everyone else on the track event. All winners of the 2016 e-Rallye Monte Carlo; we’re the underdressed ones. This was a quite satisfactory, if completely unexpected, ending to a great adventure. Not bad given that I had performed the timing on my cellphone. It took us about three seconds on the way home to decide we’d go again “next year”, which – if you beared with me until now – you know is “next week”. So I will close this entry by promising that it will not take another year until we report back from the 2017 edition. Honest! Image sources: Calendar – world4.info; Rallye Poster – Automobile Club de Monaco; Keep Calm poster – some meme generator; Fontainebleau, refueling, car shots – Jo Lillini; track pic – Club du Pôle Mécanique; all other pics – Wattwurm! 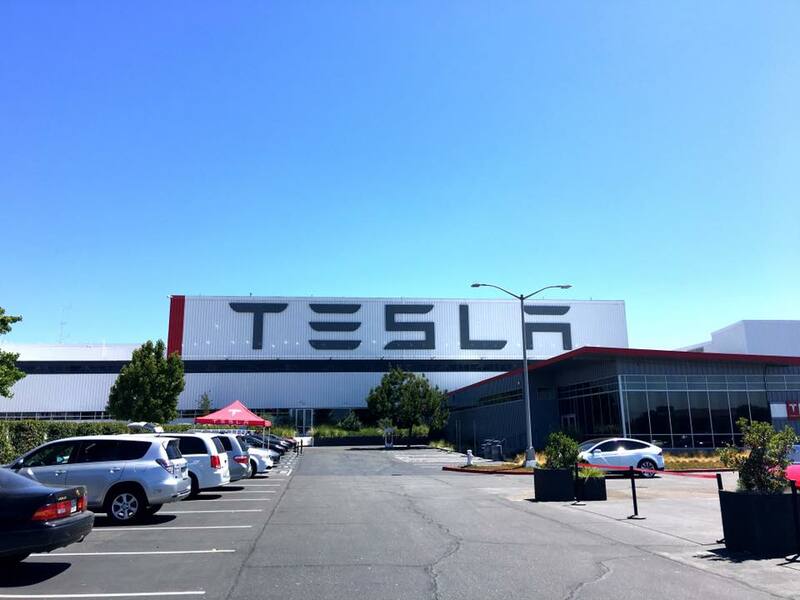 Some of you might wonder what has become of our plans to attend the Gigafactory opening. Well, we actually managed to pull it off. We found someone kind enough to give us two tickets, and we were able to attend the event and see what’s going on in Reno. To be quite honest, we do understand that slogan. Reno wasn’t exactly the most exciting place we’ve ever been to; plus, it has a drastic shortage of coffee shops. Some of you might know that’s a disaster for me, and reason enough for a state of emergency. 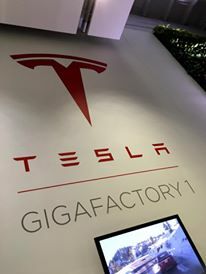 In any event, the Gigafactory opening was a really cool party, and we got to visit the factory itself. Now if anyone out there thinks building that factory was just a spur of the moment thing, believe me, it’s not. 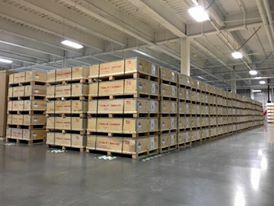 Even though it’s only around 15% finished, the factory is already huge and it’s pumping out Lithium cells like crazy. We’ve seen a great team of young engineers, overmotivated and full of passion. 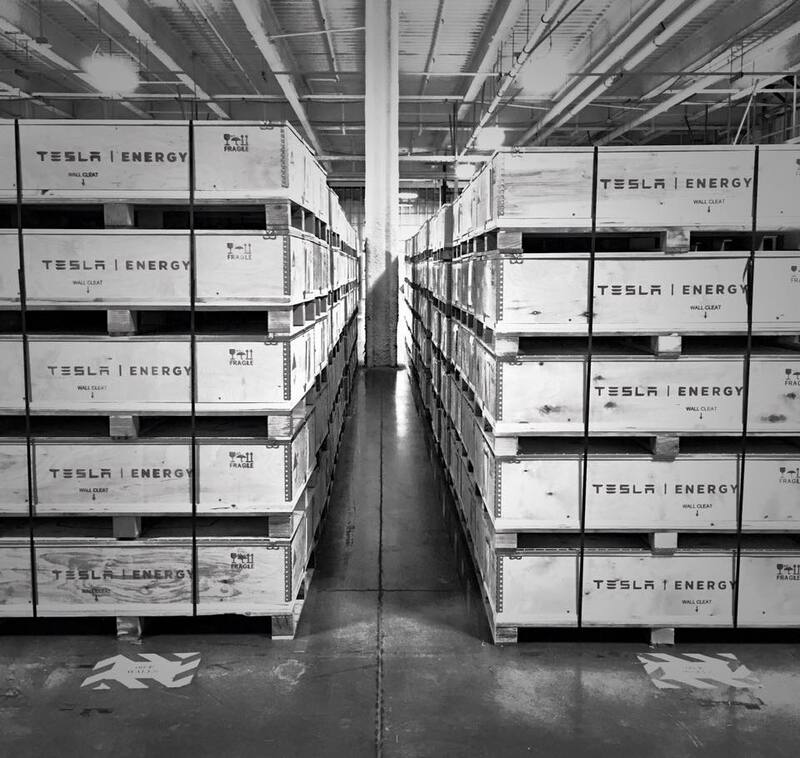 If anyone thinks Tesla and Panasonic aren’t serious about getting s**t done, believe me, they are. 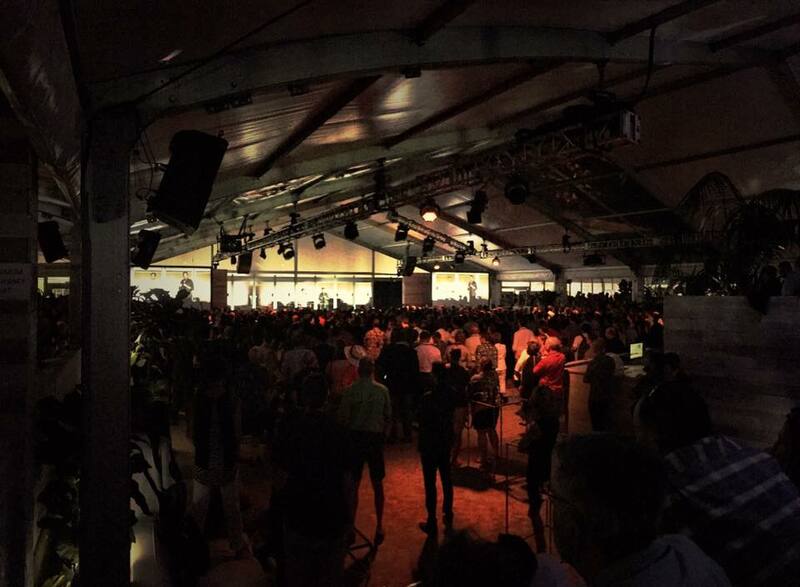 The party itself was kind of laid back, of course it included a speech by Elon Musk, great food and cool drinks. 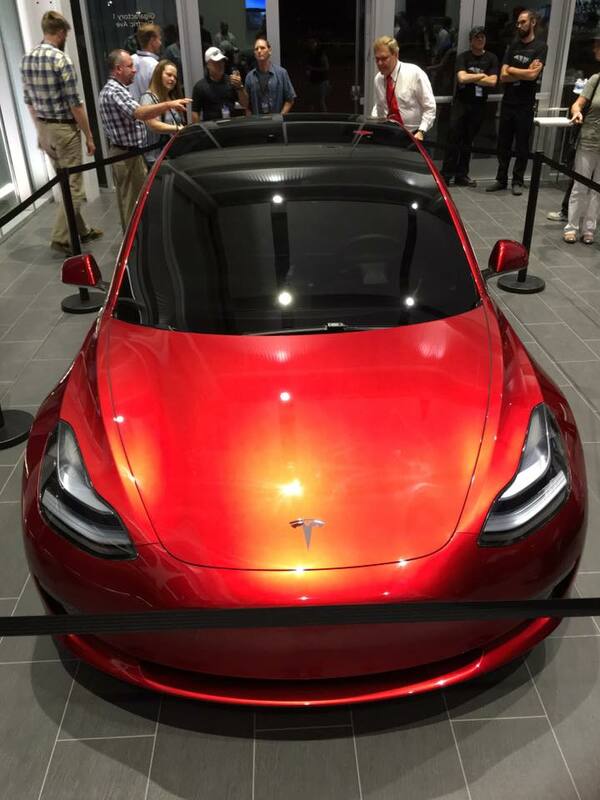 Incidentally, we also managed to take a closer look at the Model 3 on display. Also, and that’s at least worth as much as the whole trip, we met awesome people and made new friends. How cool is that? We’ll grab this opportunity to say thank you once more to our kind hosts Norman and Judy for the tickets, and Tudor for being our MC for the night. 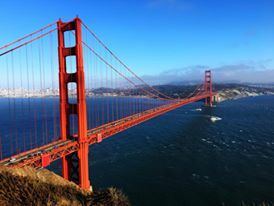 After the event, we toured Nevada and California. 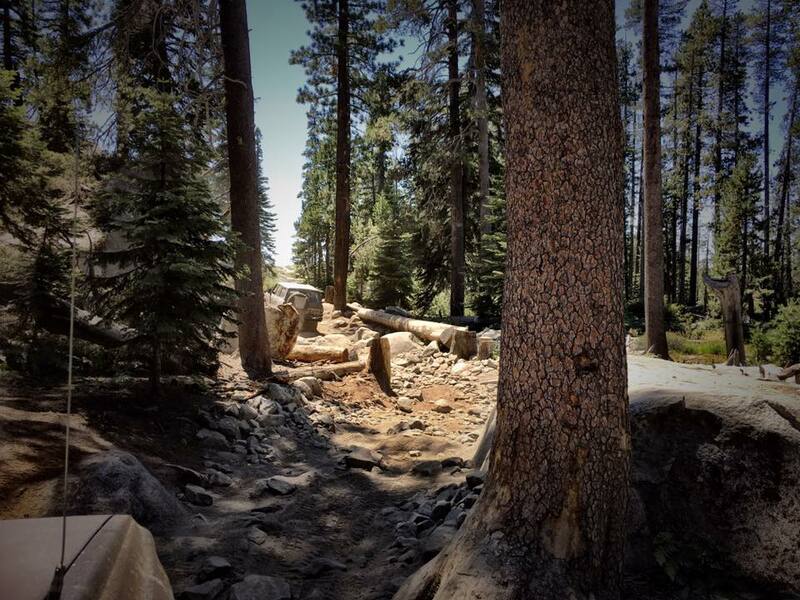 Awesome landscapes and lots of fun. 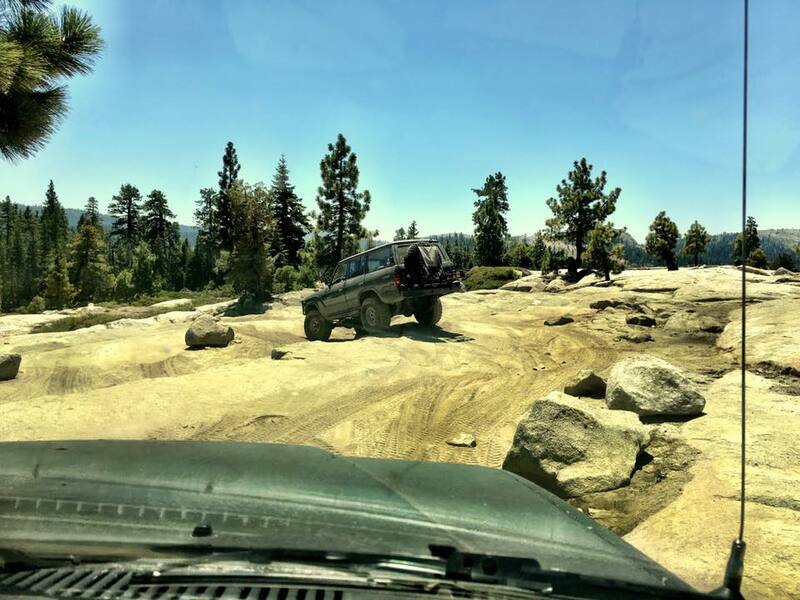 Another high point of the trip was going four wheeling in the Sierras with our California friends. That was another outstanding experience we aren’t likely to forget soon. So, you say, great news, great trip, back home and business as usual right? Well no. 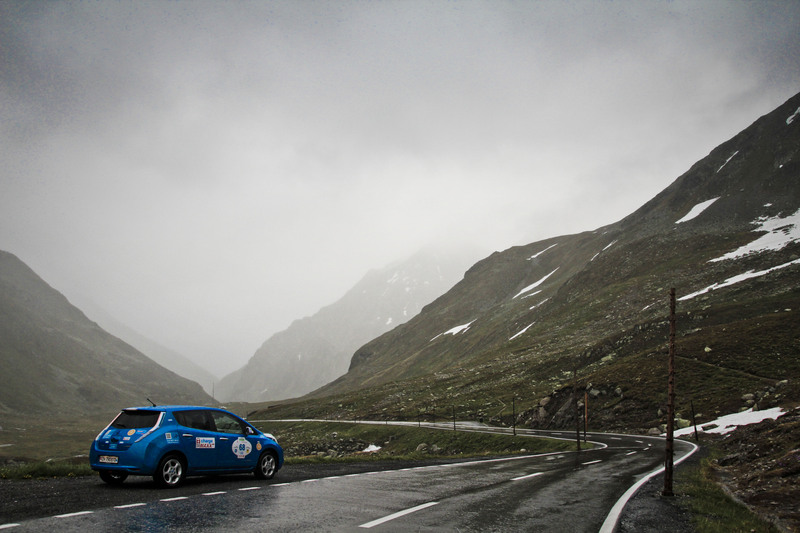 We had barely been back when we decided to go for another adventure this year: the Rallye Monte Carlo. Yes, that’s right. Any car buff will have a slight OMG moment just hearing this – at least I did. 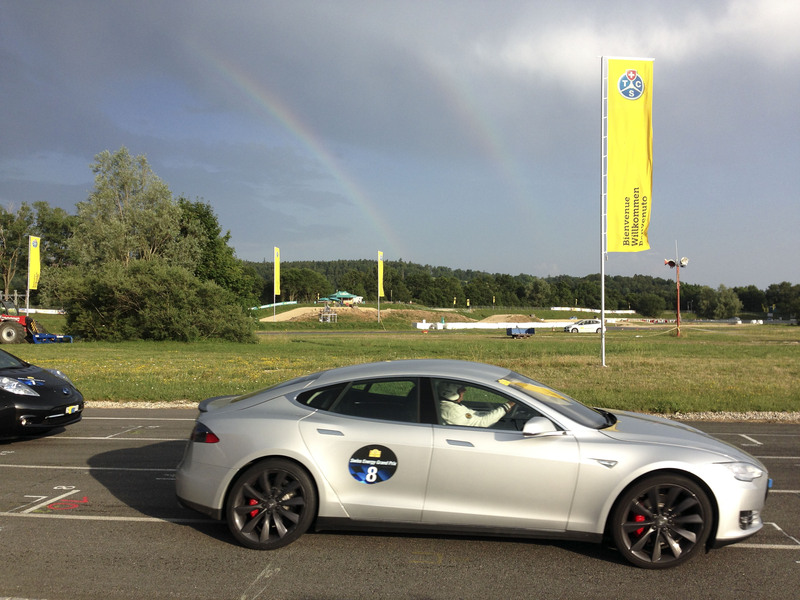 But of course we aren’t attending the “big” Rallye but the electric version of it. Specifically, it’s a regularity challenge between Paris and Monte Carlo taking place between October 12 and 16. It’s a professional rallye hosted according to FIA rules which is a first for us. So even though this Rallye is nothing like the classic Monte, it will still be challenging. 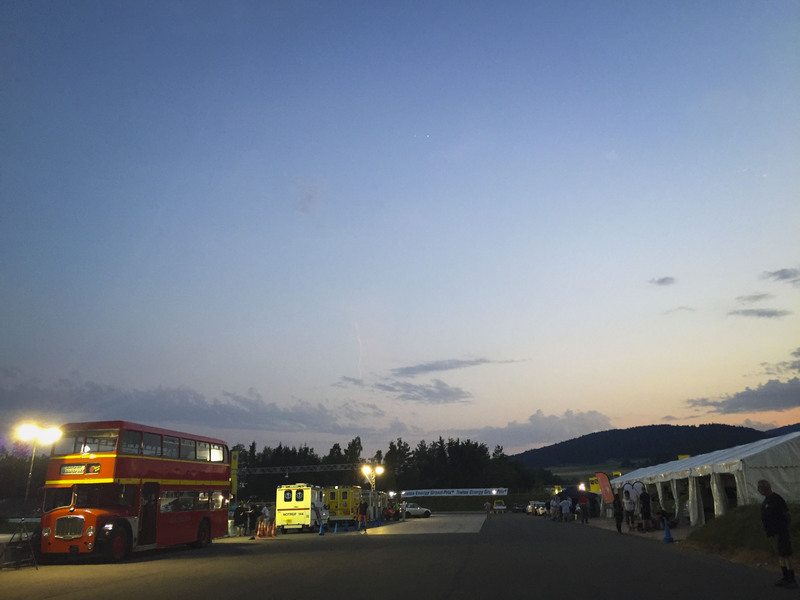 It includes a track day and driving the Col de Turini at night, just like the big event. It will involve lots of calculations, time keeping and map reading. Given our history with electronic navigation aids, this time we decided to take along paper maps. Anyway, if you’re interested in what will be going on during the Rallye, make sure you follow our facebook wall. We’ll be posting regular updates and pictures as usual. Unlike the WAVE, we won’t have time for daily blog updates, but make sure you check back here in the next few weeks since we will be posting a summary of the Rallye. To finish, here are a few more shots of our last trip. Yes, hello, we’re back from the dead. Why the silence, you ask? Well, we started a new project recently and have been investing a lot of time and effort, at the expense of the world’s most entertaining blog (i.e. this one). Why break the silence, you ask? Why of course, because there’s great news. We’re going west! So, yes, crazy ideas are still around. 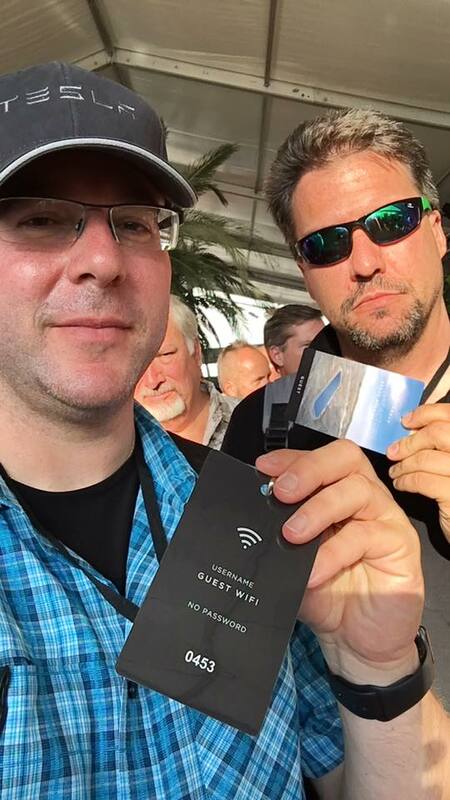 After attending the WAVE in 2014 and 2015 and participating in the world’s first 12 hour endurance race for electric cars (where we failed miserably due to a strategic error in the last 30 minutes), we have decided to attend the Tesla Gigafactory grand opening in Nevada. There’s only one slight problem: we don’t have tickets for said grand opening. 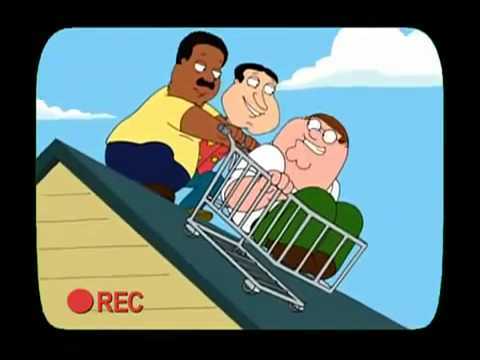 But Wattwurm wouldn’t be Wattwurm if that would stop us from doing silly things. Like, for instance, booking flights. Yes, that’s right, we’ve booked our flights already. Thanks to an elaborate scheme using 27 stops carried by nine different airlines (including Air Timbuktu), we’ve also managed to keep the ticket price down. Now. 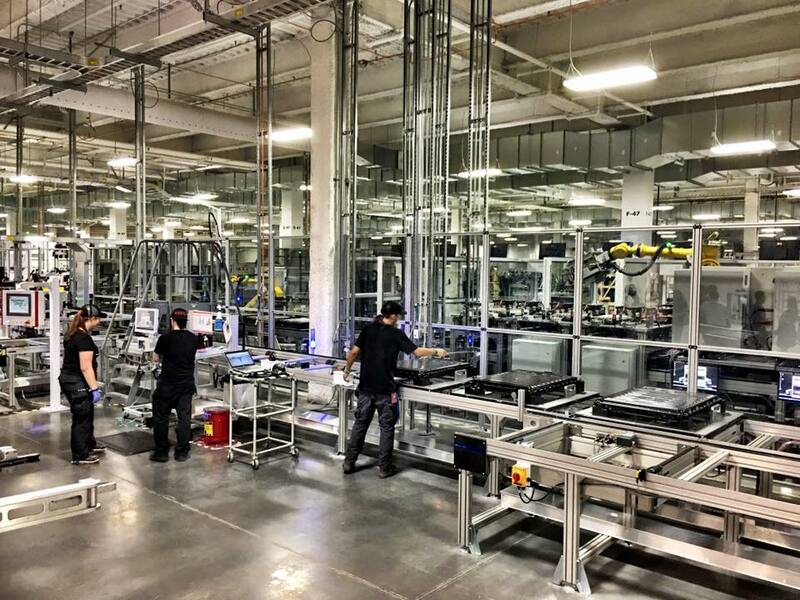 Back to the point: Gigafactory. problem. No tickets. Remember? Okay, so, what now? 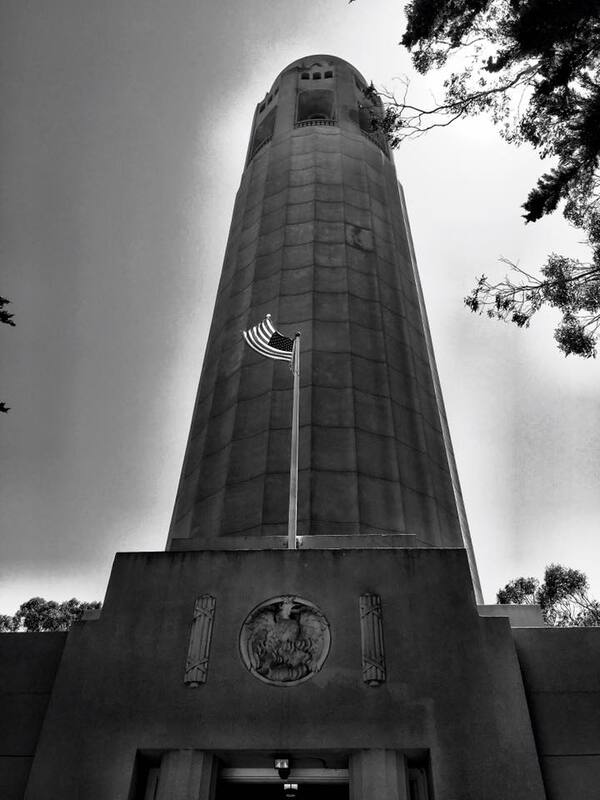 Well, this blog post is a shameless and desperate plea for your help. Yes, you! We hope that there is someone out there who has tickets, but can’t attend. Maybe it’s your cat’s birthday. Maybe you don’t have any clean underwear left. Maybe they’re your ex-husband’s and you want to teach him a lesson. It’s OK, we don’t judge. Just tell us we can have your tickets and we’ll leave you alone and whatever problem/pet you are dealing with. Oh and by the way, we’ve already established earlier in this post that we’re cheap. 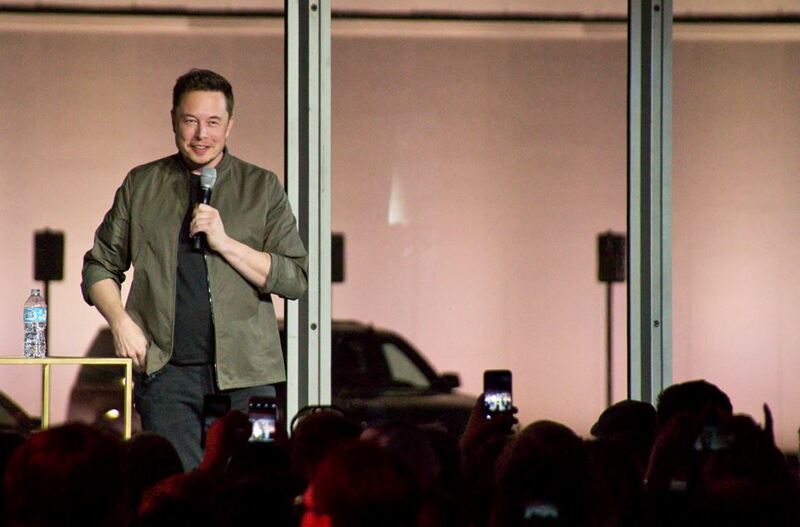 Well, in case that you’d have not only a pair of tickets, but also a superfluous Tesla Model S that’s collecting dust in a corner, we’ll be most happy to give it a good run for its money (and do you a favor since we’ll help you avoid storage damage). We need emissions free means of transportation for the week after the opening and we are planning to cover roughly 1000 miles. 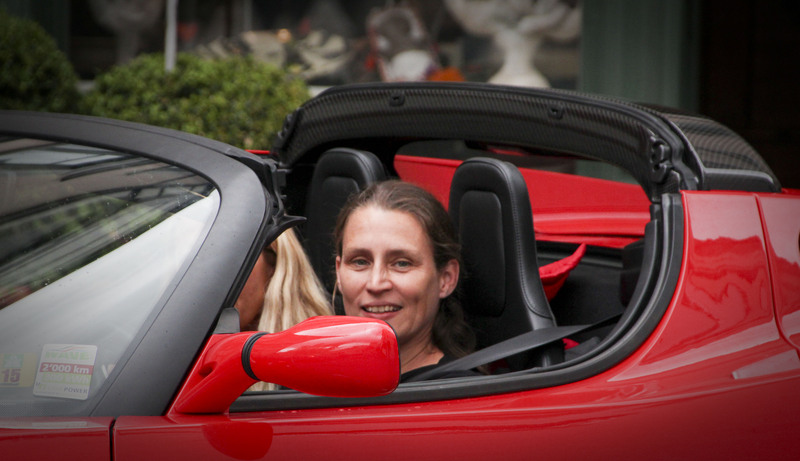 Oh and yes, we’d also be happy with a Roadster, although last we heard that would mean we have to downsize in terms of luggage. …wherein the tickets are the really important part. We can also crash your living room for a cigar and that 18 year old Scotch you’ve successfully been hiding from your friends but that part is entirely up to you. What’s in it for you, you ask? Well. Aside from the fact you’re helping two nice, awesome (and slightly delusional) guys fulfil a crazy dream, you’ll be our personal hero for all eternity. We’ll even listen to any conditions you might add to the deal since there’s always two ends to a stick and you shouldn’t end up with the short one. experts confirm there’s two ends to a stick. 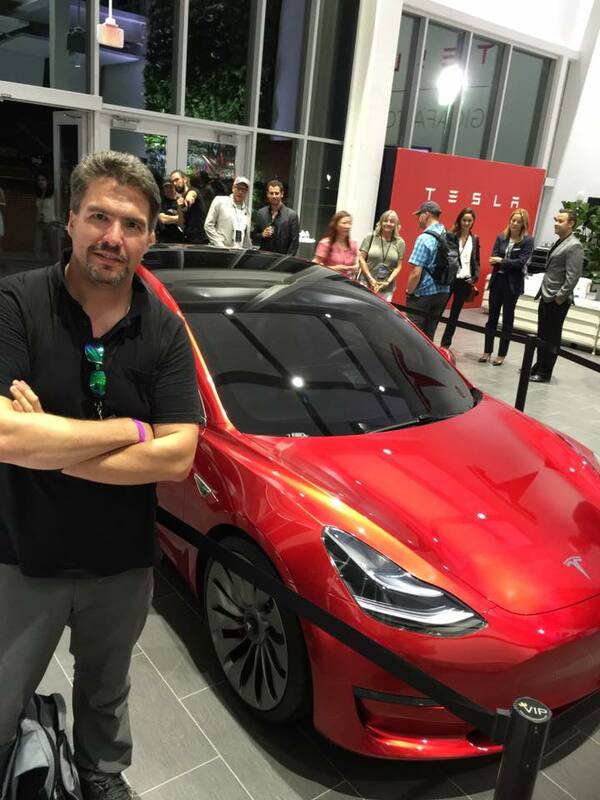 David drives a Model S 85D and we each hold a Model 3 reservation. If the fact that we’re bold and tasteless doesn’t stop you from trusting us, please get in touch with us to dump your tickets on us and/or hand over the keys to your car. We’ll be happy to help. Image credits: all images link to their respective sources. 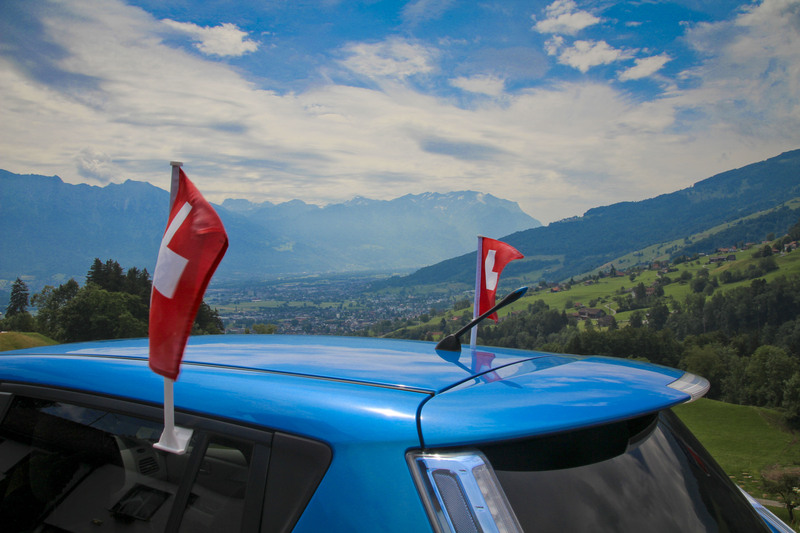 Swiss Energy Grand Prix 2015: Part 3 – The Race is On! well, here we were. 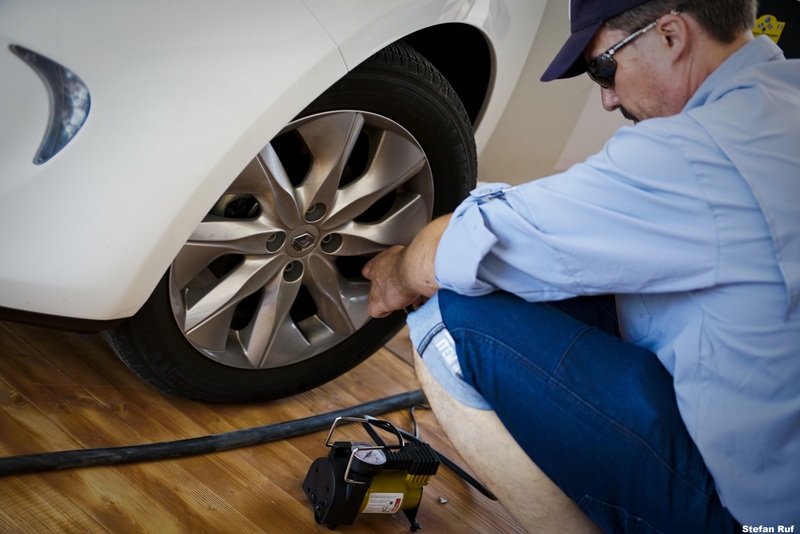 We had successfully completed the training session, had gained valuable information regarding energy consumption and speed and had basically one major problem: tire wear would be a problem. The Lignières circuit has one very sharp left corner plus to long lefts at relatively high speed. The load on the front right tire, specifically on its edge, was definitely excessive and it showed even after just one hour of training. we had already reduced tire pressure but that wouldn’t be enough. We had to exclude aggressive driving, at least over a long period of time. In theory we had to drive home on that set of tires we had on the car, all we had on site were two spares intended to compensate for a flat during the race. Thankfully, our calculations showed that a more conservative driving style would not necessarily be a disadvantage. We also discussed the track in detail, every corner, every straight. We had noticed lots of details regarding the track condition, what line to choose and where the optimum trajectory would be; we discussed all that between us to make the most of our collective effort. 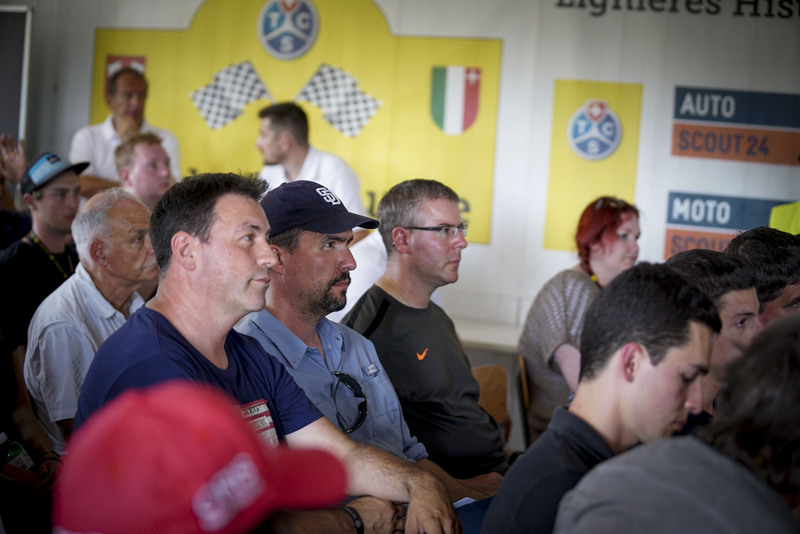 during the briefing, we were introduced to the detailed evening program; two thirty minute stops for shows on the track; other than that, just driving, lap after lap, throughout the night. The day hat been extremely hot, but thankfully, we were driving at night which would allow for pleasant temperatures. slowly, the big moment was approaching. 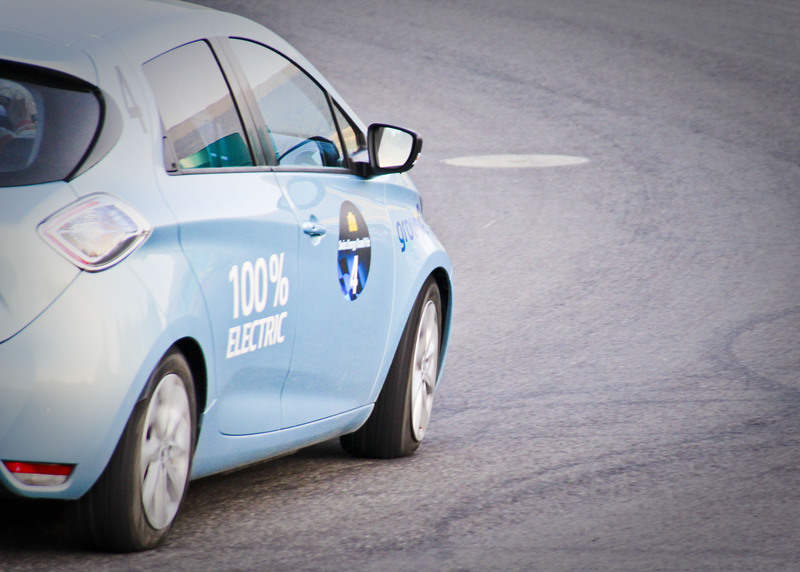 One by one, cars were placed on the grid behind our official pace car – the 2012 winner of the Monte Carlo Alternative Energy Rally. then, finally, the race was on! of course, the track was crowded at first. Conflicts of interest in terms of strategy were obvious; cars with a more agressive and fast MO got stuck behind those who were aiming for a more economic driving style. One of them was the Chargelocator Model S; they had pulled off a nice show the night before, but now they were going slow and easy. it was clear that they were trying to get as many miles out of that battery as possible without charging. After a few laps, things slowly cleared up. Everybody was familiar with the track, passing slower cars got easier and easier and the field was distributed more evently around the track. Karl was our first driver; he managed to get through the excitement of the first few laps without trouble and soon settled for a continous speed and regular lap times. we measured lap times continously and discussed speed and consumption as time went by; from the results of the training session it was clear that having a strategy was one thing, but actually adapting our strategy to the current situation as time progressed would be the key to success. We decided for an early charging stop, ahead of everyone else, just before the first time out. we were quite satisfied with our consumption and our battery status. Also, as expected after the first time out most cars had to stop and charge (as charging was not allowed during the time out) which left the track to just a few cars, making it much more pleasant to cover continous lap times with little consumption. Things were going well. Alex was the second driver and managed to follow up to what Karl had begun. At our second charging stop, again before the next time out, no changes. Excellent battery status, great lap times, outstanding energy consumption (or rather, economy). After the second time out, no more forced stops. From now on it would be just our own decision when to stop and how to charge. David was next and was no less successful than the other two drivers before him. However, as the night progressed, things were slowly starting to deteriorate. For some reason, we no longer had the full charging power. 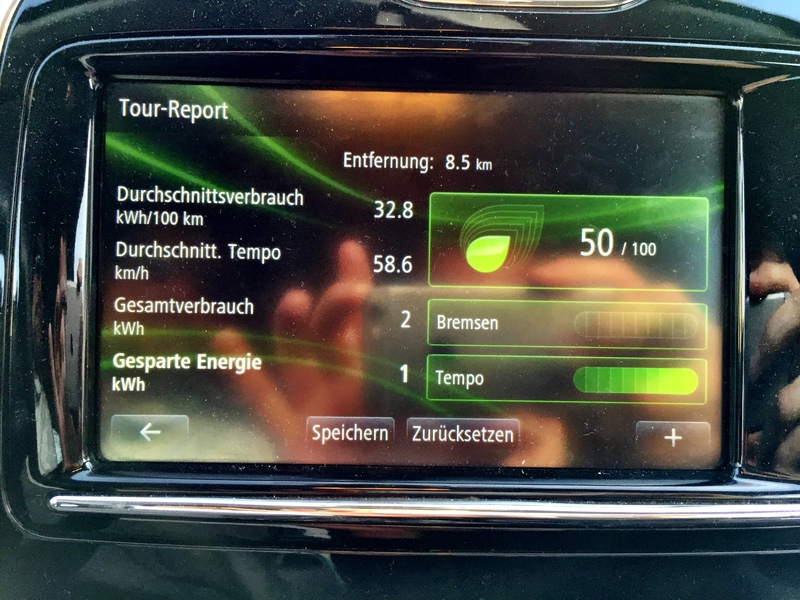 Instead of the theoretical 43 kW our charger (and the Zoé) could handle, we were hovering around 26 to 30 kW, which meant that most of the advantage we were expecting due to fast charging was killed off. Even more, we could only hope that the other Zoé teams would encounter similar problems, because if they still had full charging power, things would be hopeless for us. The next drawback was the fact that after a certain point, regeneration was reduced. The Zoé is capable of up to 43 kW of regen power going back to the battery under braking; starting around 2:00 am though, we were stuck with a mere 15 kW of regen power, which meant that any breaking energy above that level would be destroyed mechanically in our brakes instead of going back into the battery. This in turn meant that our consumption went up dramatically; our strategy had just blown up in our face. Well, what’s left to do but to carry on? Since we did not have any kind of knowledge regarding the charger and battery management system of the Zoé, all we could do was make the most of it and go ahead with what we had. Our hope to make it to the top was gone but we were still determined to finish somewhere up front. And that’s what we did: carry on. 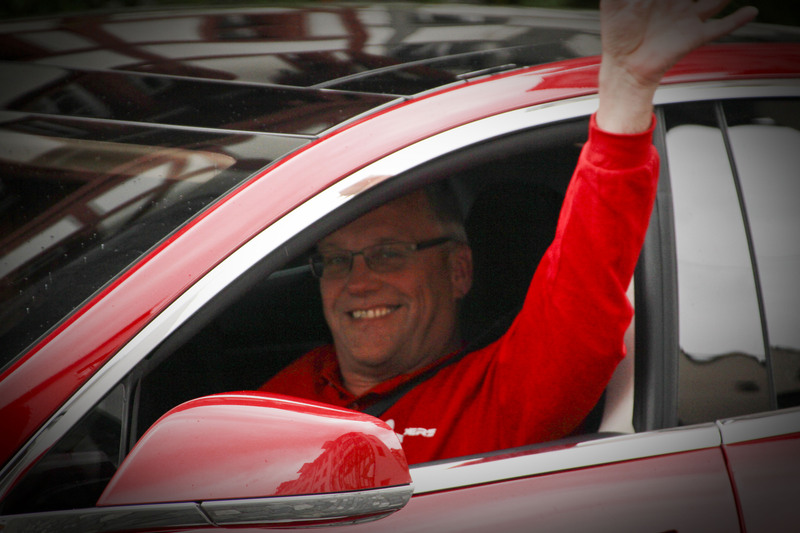 We kept going through the night, charging whenever necessary, changing drivers to make sure everyone covered the mandatory drive time imposed by the regulations. That night was endless and short at the same time. We were wired, charged with electricity, under power. Okay, no more fishy analogies from now on. because that would be a completely different game. Thanks to the fact it was early July, dawn was soon to arrive. it was quite magical to be on the racetrack in the dark and see daylight approach while our cars were moving lap after lap. And don’t forget that we’re talking about electric cars, so it was almost completely silent, only the occasional low key whiz from a car passing by would be audible. to spice things up a bit, there were two “Power Plays” where laps would count double. we had successfully completed the first one just after midnight, but the second one was still ahead of us – it was simply the last half hour of the race before the finish. At this point, we think we made a strategic mistake. We might have been distracted a bit, maybe we were just tired – remember we just had spent all night on the racetrack – in any event, we stopped for a last charge just before the last power play and we should have gotten back on the track earlier. Somehow we managed to charge an extra ten minutes we wouldn’t need and that’s when the BMW i3 snuck past us in the ranking. Dang! And finally the arrival! We really made it through the night and saw the checkered flag at the end. What an experience! 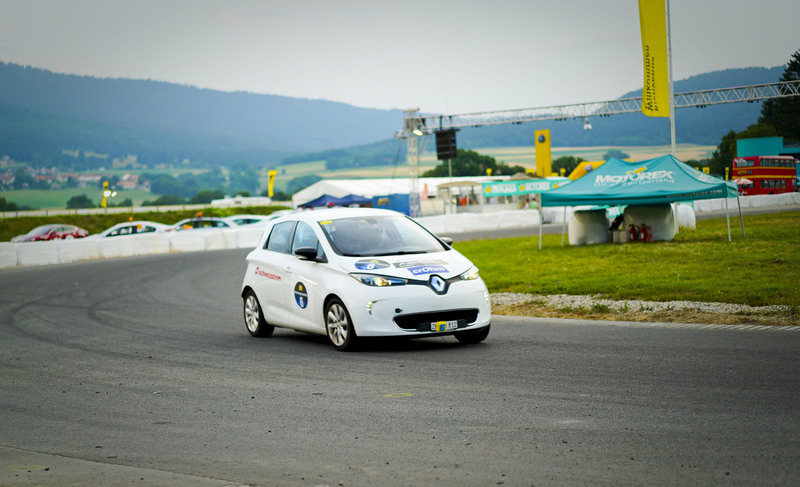 congratulations to the winners of this year’s Swiss Energy Grand Prix: Car number four, Zoé Team 1 from Renault Suisse. Great show guys! What’s left? Great memories of an incredible weekend and an incredible experience. We’re incredibly glad we participated and had one heck of a time. We’ve met great people and had loads of fun. 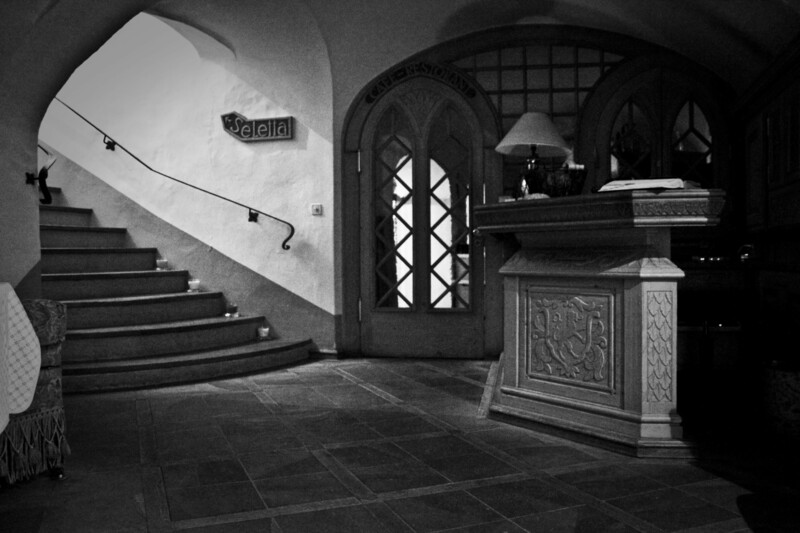 Special thanks go to our photographer Stefan Ruf, about half of the pictures in our gallery are his work. You’ll find all pictures of our weekend in the gallery at the bottom of this post. Please take a moment to see what he did, it’s really great. If you like what you see, share his video and perhaps like his channel! And of course, last but not least one last “thank you” note to our sponsors who made all this possible for us! Well, there we were. Our team was complete, we had a car and someone to finance our participation. 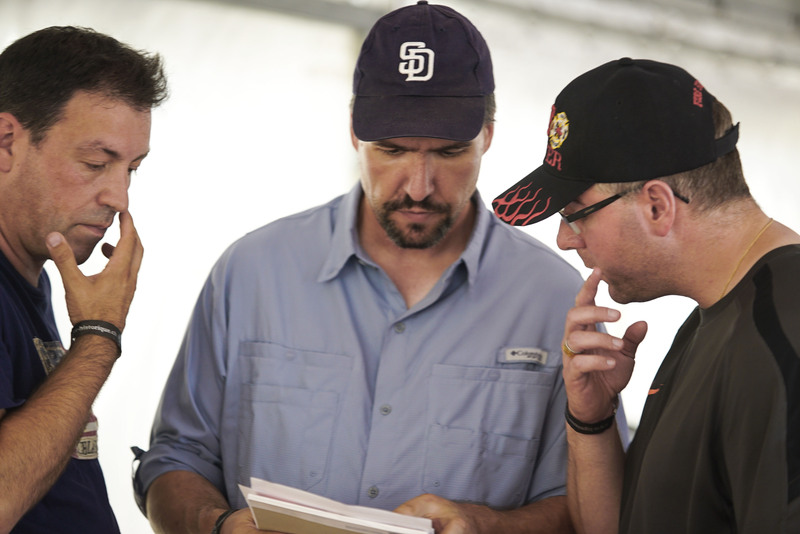 All we needed now was a strategy and some equipment – sounds easy, but remember we had just returned from the WAVE! We had little more than a week to get things going, and to be quite honest this years WAVE hadn’t really been a vacation, which didn’t exactly help. In any event, we ordered some karting gear, checked that everyone had a helmet and most of all, made sure we had proper charging equipment. We were able to engage crOhm as a sponsor, they were kind enough to lend us a portable 43 kW charging station over the weekend. We’re grateful that crOhm was willing to help us out, please support them by checking out their website and of course buying their equipment if you need a charging station! Other than that, there really wasn’t much time for anything. 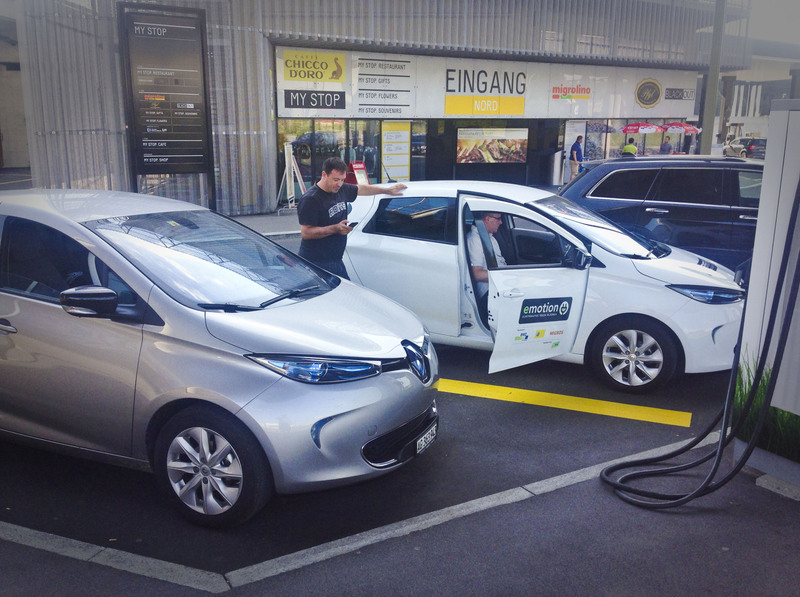 we managed to test fast charging at the myStop station in Affoltern a few days before the race, only to find out that apparently both Zoé’s we had at hand were unwilling to charge at full power. Still, we collected a few interesting facts during that test which would be helpful for the race. just a few days later, we brought the car to be labeled properly. A printing company added our main sponsor’s label, Schweiz Strom, and by chance, the red logo came out really good looking on our white car. 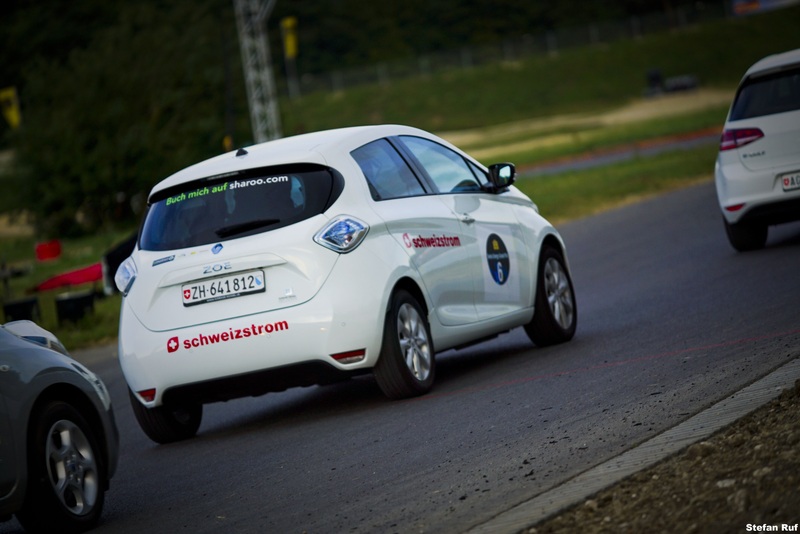 Schweiz Strom is a power label run by EBL, please visit their website to find out more. finally, the big day had arrived. We went off to Lignières on Friday morning. Technical inspection! The main rule was that the car had to be street legal in every respect. Neither slicks, nor removing seats would be allowed, let alone deeper modifications. When we arrived on site, we were seriously impressed. 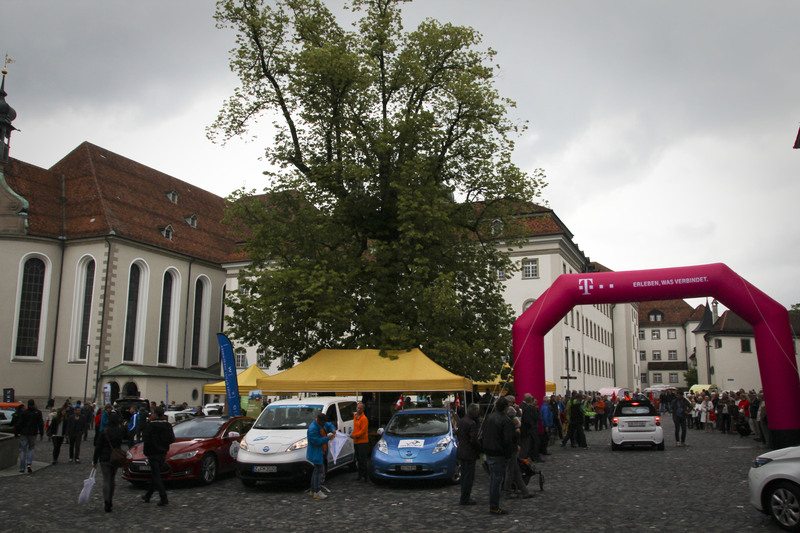 The field consisted of eleven teams in total, and the charging equipment people had brought with them was impressive. 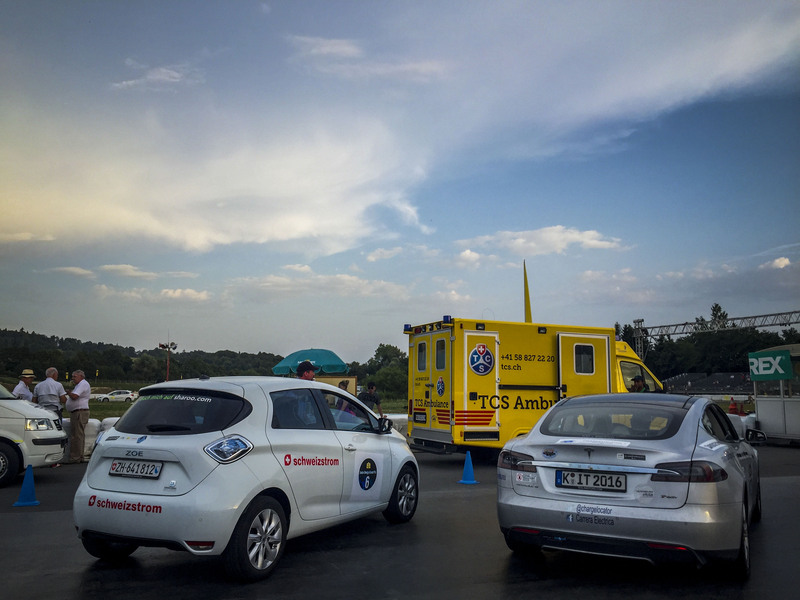 Immediately next to us, there were two Renault Zoés and… wait… they really brought a Terra 53 fast charger with them? That’s like bringing your RPG along when you need a pocket knife, you know, just in case. Of course we soon found out that our competitors were in fact a double team entered by Renault Suisse; they had a whole team of engineers and mechanics, plus six drivers with extensive experience. So by now it was clear that competition would be tough, things would be really interesting. 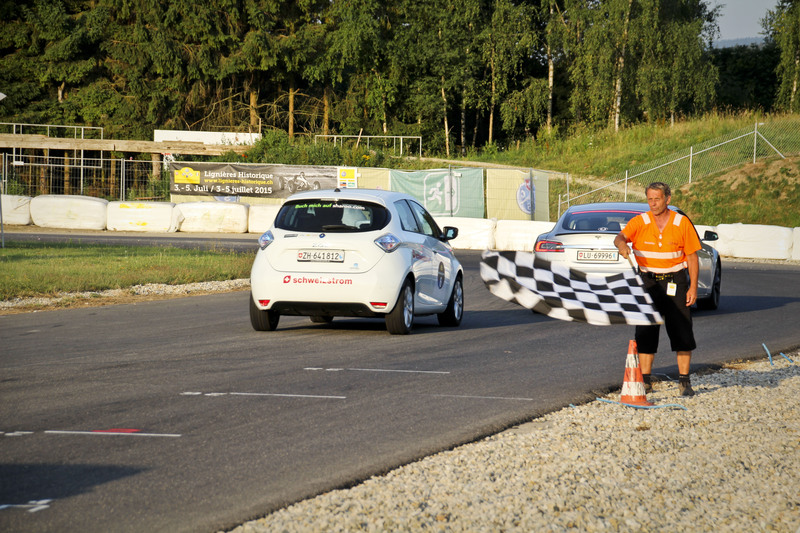 To complete the field, a fourth Zoé would be competing with us, driven by a team of Tesla Club members and the club president, Stephan Schwarz. You might remember that Stephan too is one of our sponsors, he supported us by providing us with a car through his company. 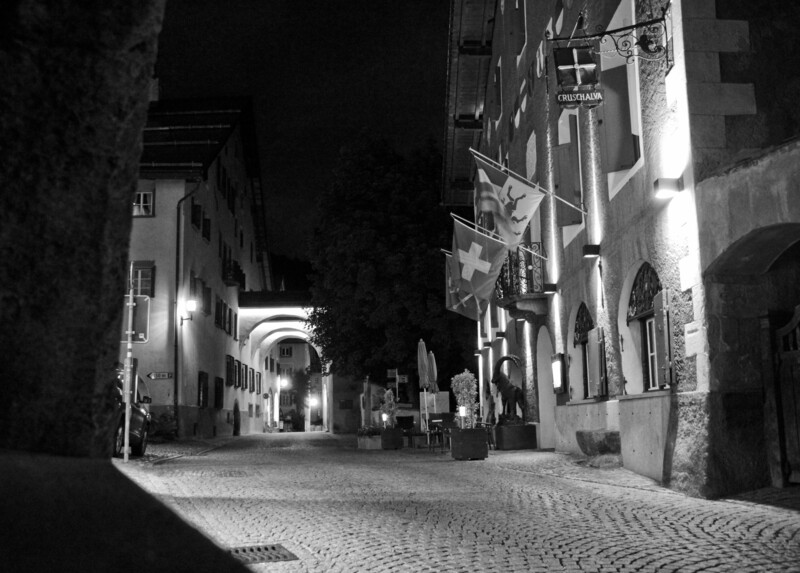 ABSS is a team of architects located in Volketswil near Zurich offering expert knowledge and extensive experience. Please check out their website for more information! Throughout a very hot day, we were checking our gear and the state of the car, we passed technical inspection and we walked around the track discussing lines and strategies. Finally, the big moment had arrived: the training session was about to begin! We had decided that the simplest way to determine a proper strategy was to measure consumption at different speeds – and so we did. All three of us had about 15 minutes of track time, and we chose every possible driving style between a 90 year old retired accountant and a fighter pilot on steroids. Needless to say, the latter was certainly more fun but the former no less challenging. As expected, energy consumption was anything but linear and we found out that the perceived advantage of fast laps with frequent fast charging wasn’t as big as we thought. The fact that there were basically just three short straights and otherwise mostly tight corners meant that one lap consisted mainly of heavy accelerating and heavy breaking with very little continuity. By putting lap times and energy consumption in relation, we found out what kind of average speed we wanted to aim for and managed to find what would be our optimum. There was, however, a major drawback: After the training session, we checked our car and found out that we had excessive tire wear on the front right tire. That wasn’t entirely surprising given the track conditions, but it was still bad news; extrapolating that kind of damage over twelve hours led to the conclusion that we wouldn’t survive just on one set of tires. We did in fact have two spares, but those were thought to be a last resort in case of a flat to be able to finish the race, not as expendables. 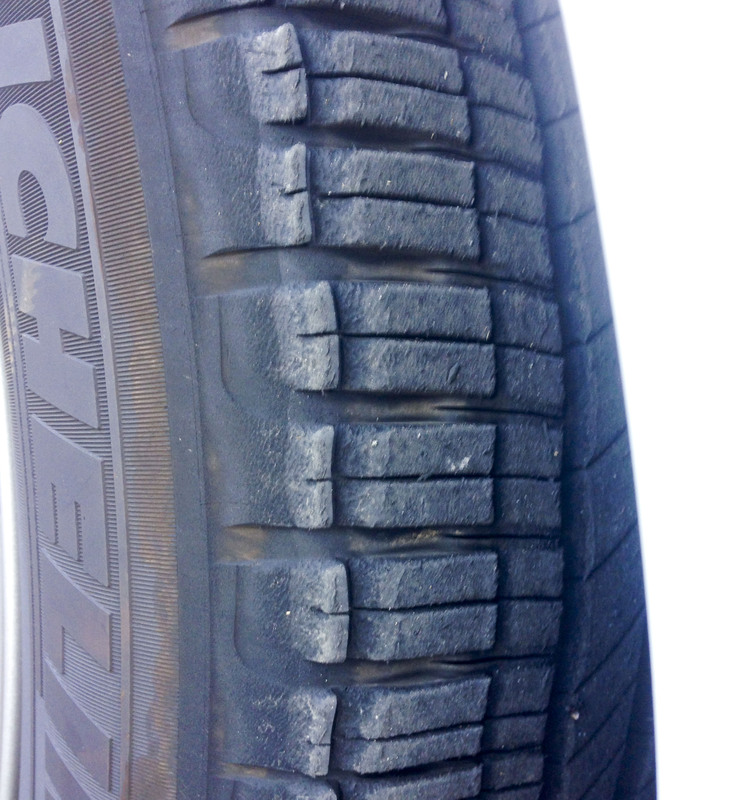 Therefore, tire wear had a serious impact on our choice of strategy. 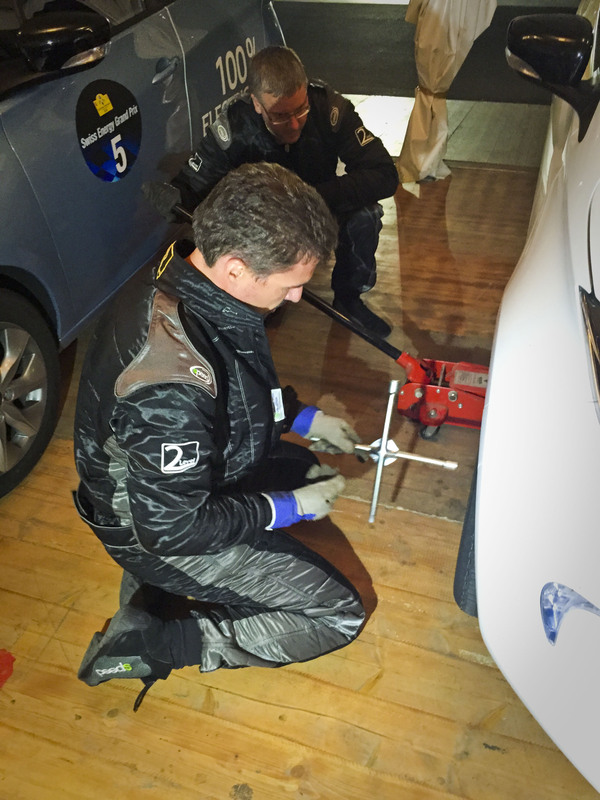 Thankfully, our competitors from Renault Suisse had a big heart and were willing to share information about what kind of tire pressure they were using. To minimize consumption, we had pumped the tires to 3.4 bars but in retrospect that was too much for the tight corners we found on the track. We reduced pressure and went back to what our pit lane neighbors were recommending. slowly, the big moment was arriving. we spent most of saturday on site, checking once again that the car was in order and all our gear functional, and eagerly waited for the race to be on. At last, we were asked to place our cars on the grid for the start! the big moment had arrived. join us again for our next post, for a summary of our race night. 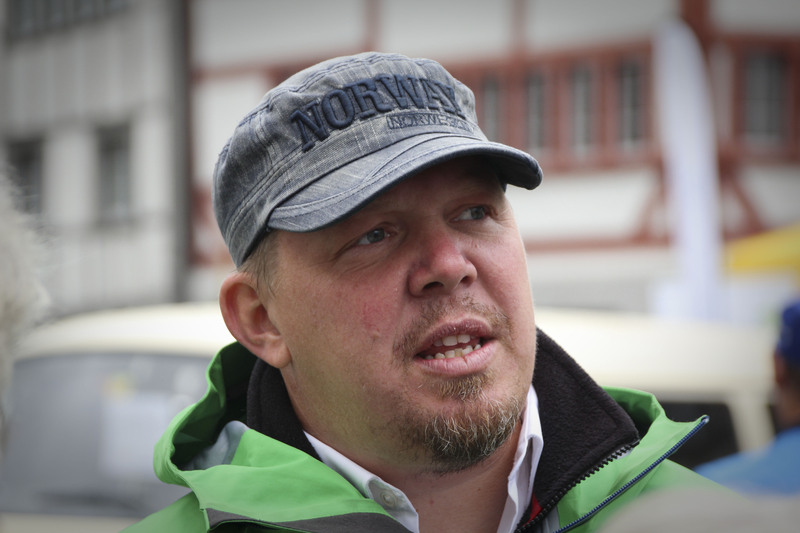 Not too long ago, our friend and Swiss Tesla Owners Club president Stephan Schwarz said “hey did you hear, there’s a twelve hour race with electric cars, wouldn’t that be a challenge for you guys?” Obviously, he had our immediate and undivided attention, which isn’t as simple as it would seem. It took about three seconds for us to dig out the corresponding web page, check out the details and download the rules and regulations. Well, lots of surprises were waiting for us. Twelve hours – only interrupted by two thirty minute breaks – of driving on the Lignières racetrack, the only closed circuit racetrack in Switzerland due to a sixty year old law passed as a reaction to a minor racing incident in 1955 which totally didn’t make motorsport history. As you can see, the circuit is rather small and winding and we would soon find out that there were a few challenges waiting for us on the tarmac – but let’s not get ahead of things. At this point, we’re still reading the rule book – ouch! A sizeable sum would be required to participate, way above our fun budget. 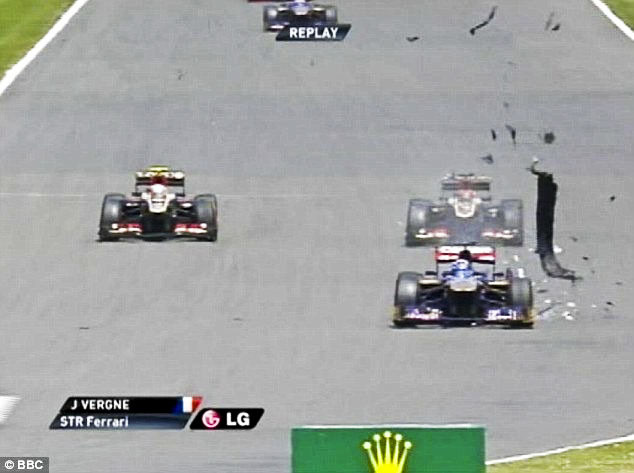 Oh and it also stated that a team would imperatively consist of three drivers. Our avid readers will know that Team Wattwurm historically only ever consisted of two guys – now what? you know, like, go find a third one. 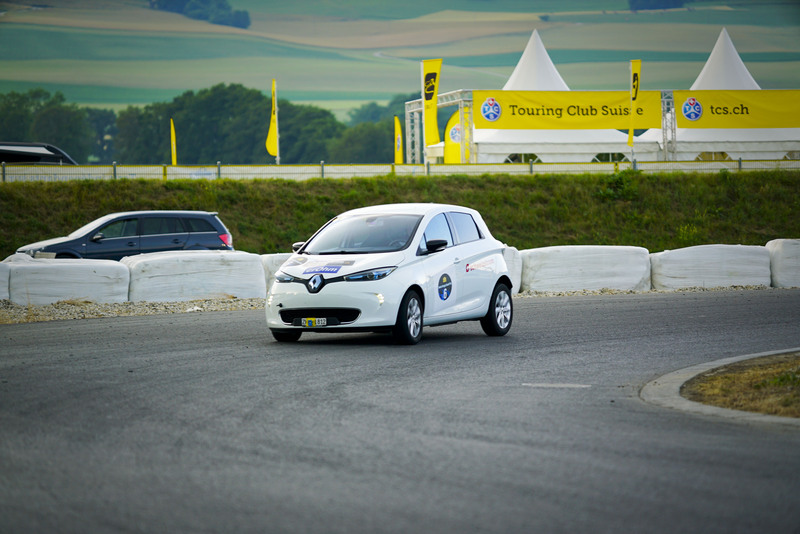 At least it was pretty clear that we would have to participate in a Renault Zoé. 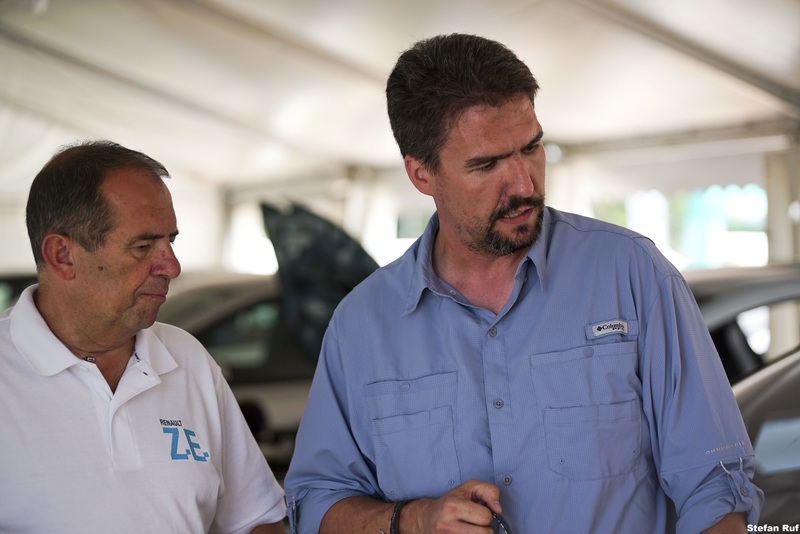 Given that the Zoé is currently the only model in the smaller class that can charge with 43 kW peak power, there was no alternative if we wanted to have a chance at all of winning or getting close. The Model S does have a huge battery but we estimated that the total distance covered in 12 hours would be greater than even the Tesla’s battery range, and once you have to charge, unless you have a Supercharger at hand, you’re stuck with 22 kW peak charging power. Advantage Zoé. But there was yet another problem. Now recently we’ve boasted about how we now have a whole fleet of electric vehicles at hand – but to our great shame we will have to admit that none of those cars is legally owned by us, they all belong to the bank. Yes, there, we said it, we don’t even own our cars, we lease. And to be serious for a moment, the reason I bring this up is that any form of track racing or automotive competition is strictly forbidden in the leasing contract (go ahead and read yours, you’ll find it). Now we are indeed talking about actual racing and not a Sunday afternoon retirement home excursion – the possibility for a mishap is always there. And since we were not exactly comfortable with the idea of ending up with not only a totaled car but also a multitude of legal issues between an insurance that won’t pay and a bank that will send a hoard of lawyers after us, we would therefore not only need someone to fork out the money for the participation fee – but also, someone would have to provide us with a car. keep going, you’re doing just fine! In addition, we were about to embark on our second WAVE Trophy; if you’ve been on this web page lately you’ll know that we covered around 3400 km in little more than a week with the Leaf, driving around Germany, Switzerland and Italy (even though we’ll freely admit that we still owe you our final chapter of the WAVE adventure). In any event it should be clear that covering mileage on backwater roads hundreds of miles away from your home isn’t exactly the best prerogative to thoroughly organize an upcoming event. Things looked grim. although we’ll admit it boils down to the fact we simply weren’t equipped properly. What now? It was pretty clear this was never going to happen. We were missing a team mate, lacking serious money, and didn’t even have a car – and solving even just one of these problems on the road would be a challenge, let alone all three. But as most of you know, Wattwurm doesn’t just give up. In the meantime we visited the introductory event (just a couple days before heading off to the WAVE) where we met the organizer Tony Staub. All our friends were there and as we were chatting along, we talked to Stephan again, telling him where whe were standing (i.e. nowhere). When we mentioned that we needed money and a car he said “well, you can have my Zoé”. 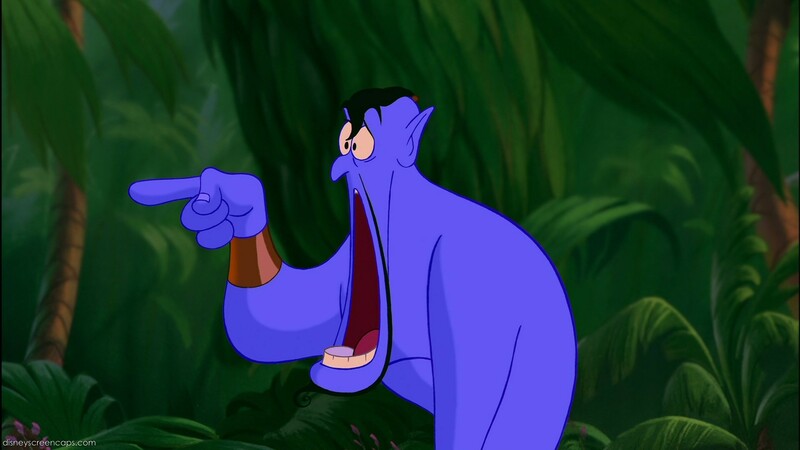 This was our facial expression for the next ten minutes. Wow. We had just solved one of our problems! We had a car! It honestly was hard to believe. Now where else to find another team mate than at an event where all our crazy friends are hanging out anyway. Suddently it didn’t seem that far fetched any more. We were still chatting with Stephan when Karl joined us and asked what was going on. Some of you might remember Karl as being one half of Team Lightning Rods at the 2014 WAVE. In any event, we started telling him and it took less than ten seconds for him to be grinning from ear to ear. It was clear that we had found our third man! 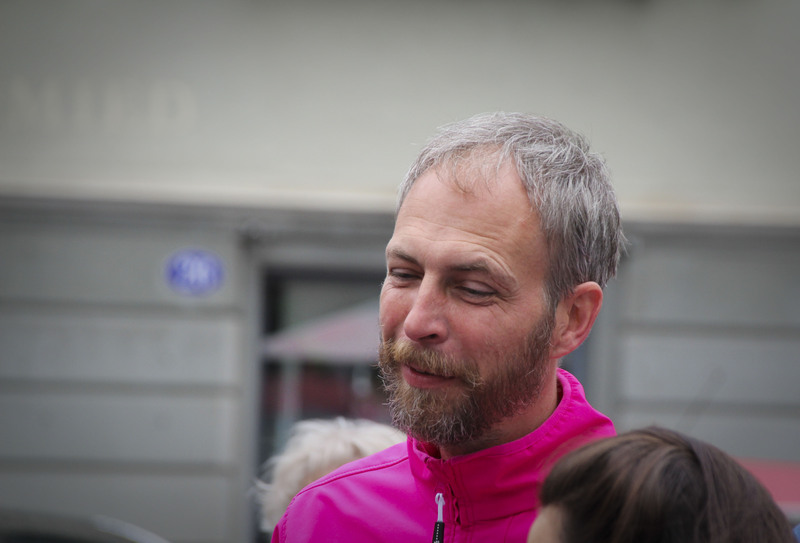 Karl wasn’t only extremely enthousiastic about joining team Wattwurm for the SEGP, he also promised to pull some strings and see if he could come up with a sponsor for the money. Because we were still talking about a solid amount of money – chances were 50/50 at best that someone would actually be willing to support us. In any event, we went off to the WAVE hoping for the best and expecting the worst. And much to our surprise, a few days later Karl rang us up telling us that we had finally found a sponsor. We had prepared numerous emails and letters which he then followed up and one of those was successful. Wow. 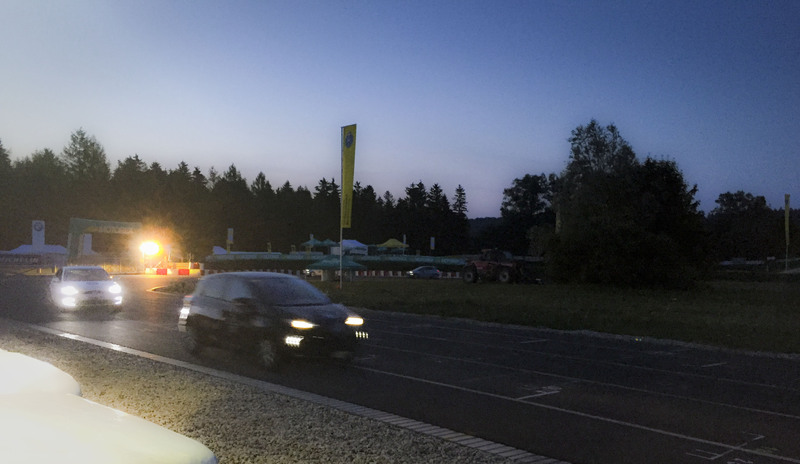 Our efforts finally paid off, the extended Wattwurm Team was going to participate at the Swiss Energy Grand Prix 12 hour endurance race in Lignières! We were about to write history. again. As usual, all pictures link directly to the sites I stole them from. I can’t guarantee any content beyond the actual pic I used so click at your own risk. We will introduce our sponsors, their business and their motivations in Part 2 of our race report. In the meantime, you can check out their websites by clicking the logos below. Well, the WAVE is over… Lots of people won lots of trophies, and we’re happy for every one of them (the people, not the trophies). We’ll include a few pics of some of the winners in here, you’ll probably be able to check out the complete list of winners on the WAVE trophy homepage soon. 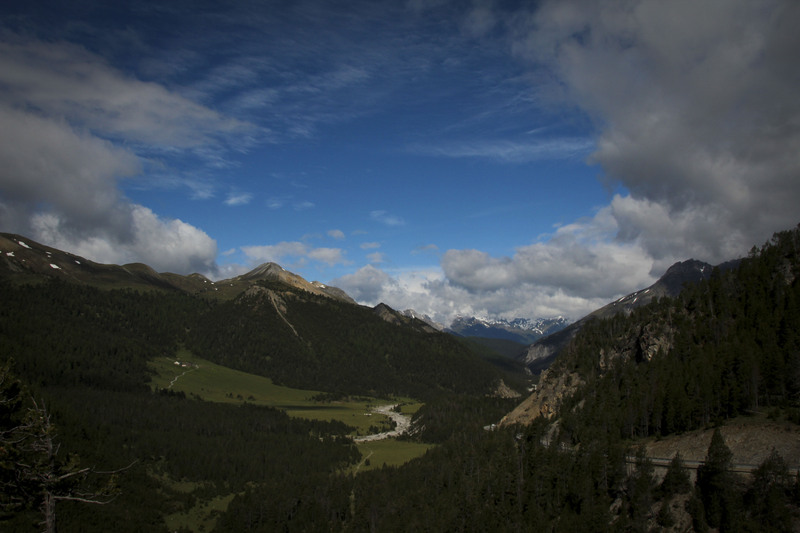 We started early to beat traffic and managed to catch a free road up the Julier pass. The weather was less than average so the photo opportunities were limited. When we stopped for coffee at the top, it even started snowing. Later on, we heard from other teams that had headed up behind us that the snowfall had intensified – we’re glad everyone made it downhill in one piece. 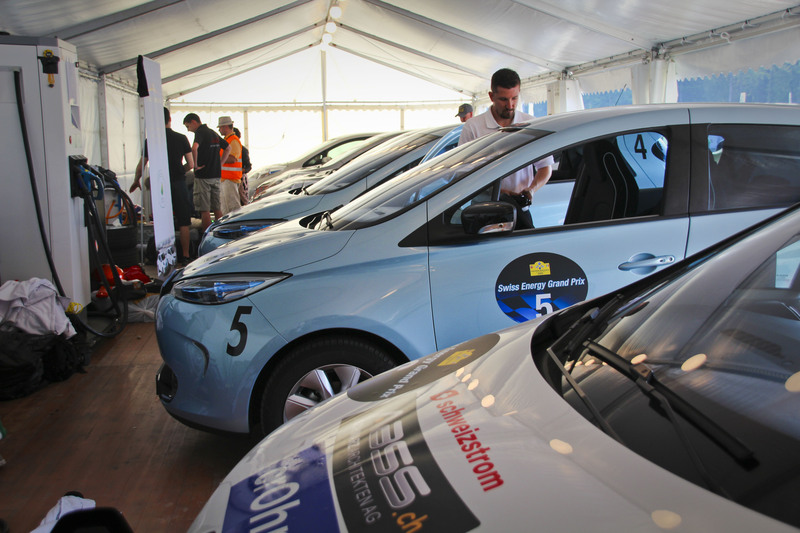 Before we left we had anticipated a certain amount of WAVE related traffic – in our world, this means that there will be teams queueing at the available fast charging points and you might have to wait for your turn with several cars in front of you. 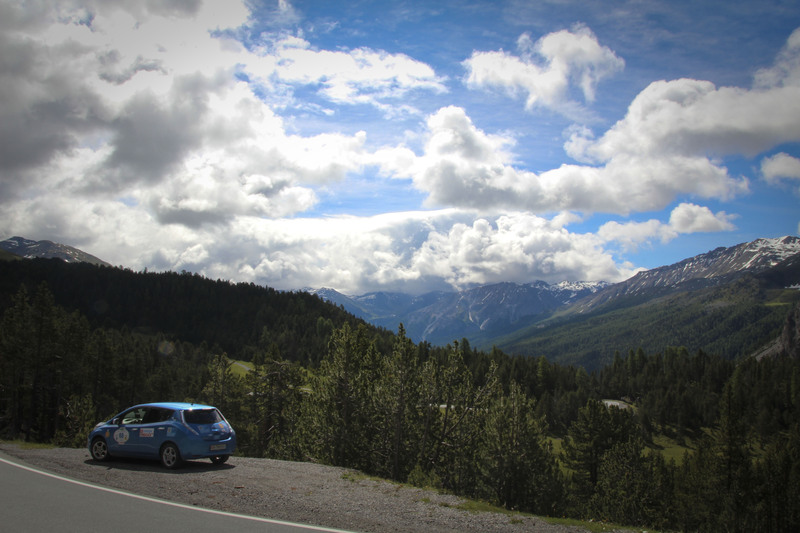 Therefore, we decided that we would avoid the most obvious choices and head for the fast charger in Flims instead, betting on the fact that nobody would make the ten mile detour to charge there. Sure enough, we were all alone and therefore able to charge immediately and for as long as we wanted. 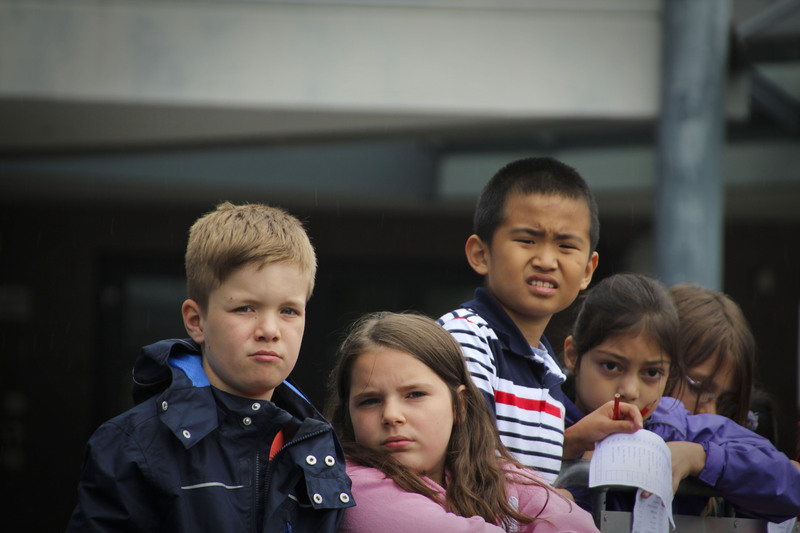 One factor we had not considered was the weather; starting around Flims, we had heavy rain for the rest of our trip to Schmerikon and perhaps some of you will know that rain affects range! We did make it to Schmerikon but by managing our speed and ending up with only a few miles of range left. 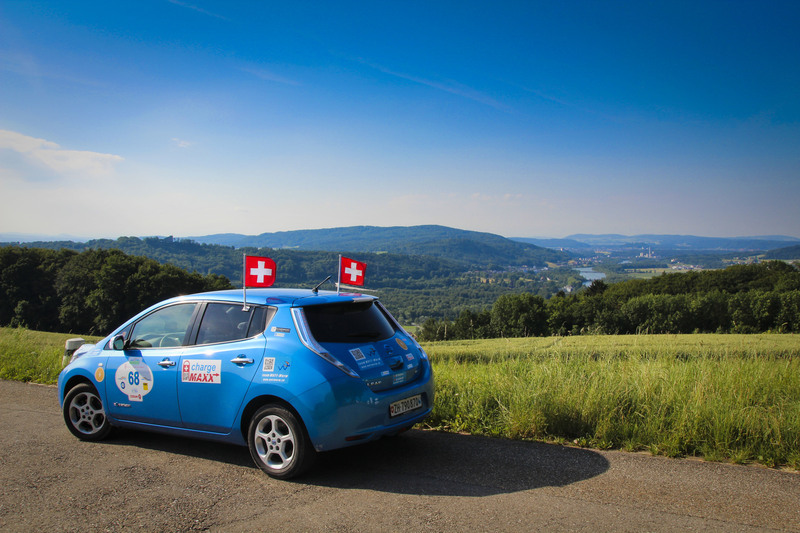 After charging enough to make it to the fast charger in Rapperswil, we went on and met two other teams as well as a local friend with his LEAF there. 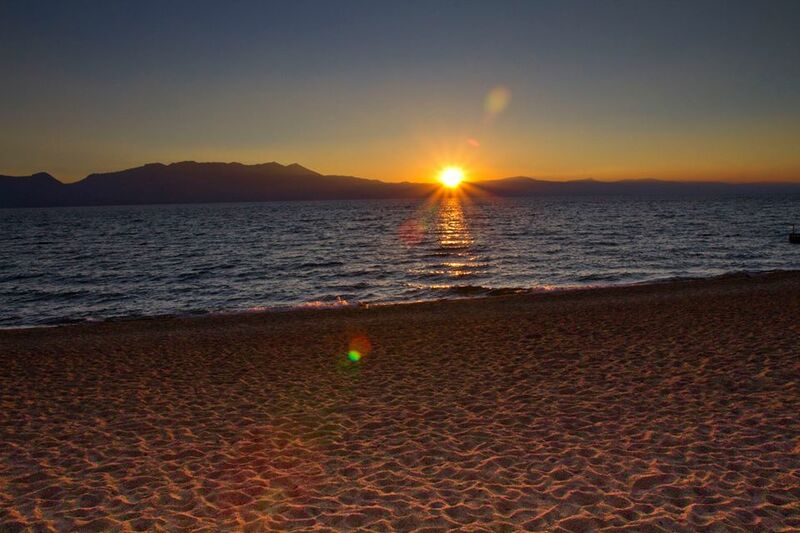 We were lucky enough in that we arrived at the right moment and we could start charging right away. 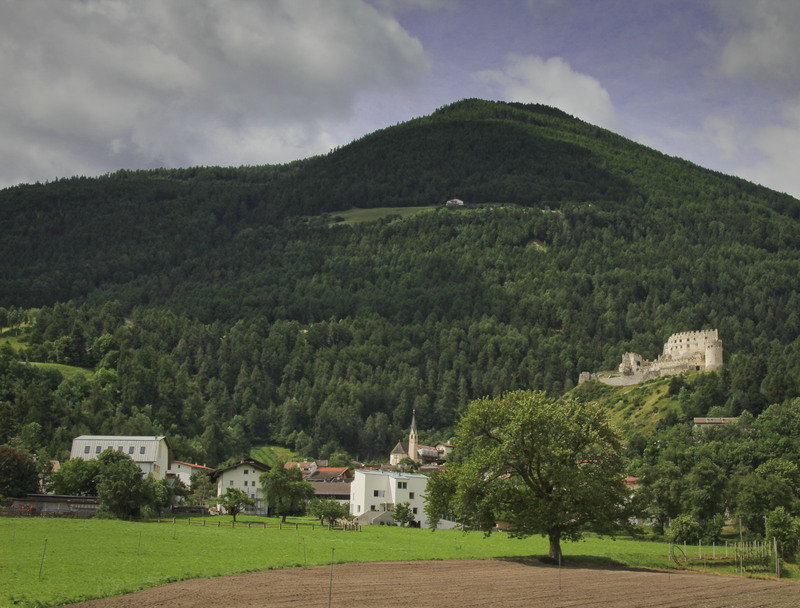 From there, it was a leisurely drive to Sankt Gallen. We stopped on the way to take a few pictures and were spontaneously joined by two other teams. 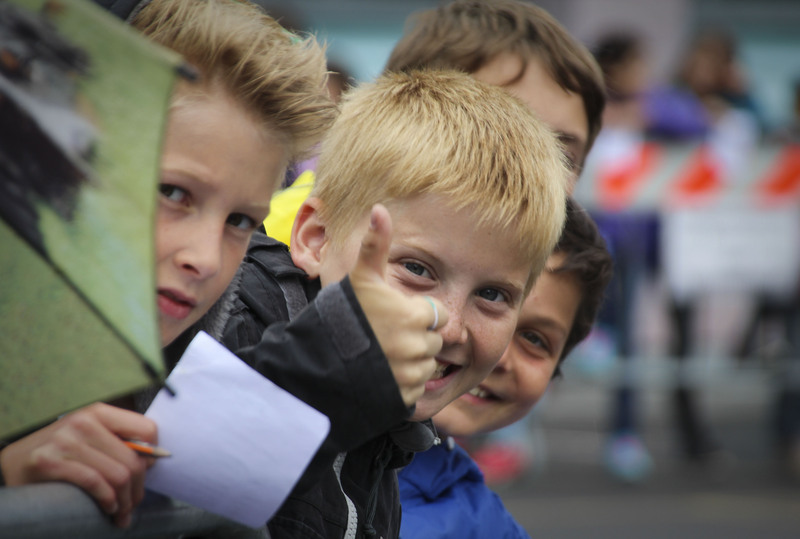 The warm welcome on the finish line in the middle of the old town in Sankt Gallen was a real highlight. Needless to say, our car got the most prominent spot (again) and we enjoyed watching our team mates arrive and celebrated our achievement together. We spent the evening in a decommissioned railway shed where awards were distributed and tributes paid to all what the support and organization teams had done during these days. We’re now back at our hotel and I can tell you that the whole week was incredibly exhausting; I have rarely been so tired. In any event, this is just a summary of today without any further insight. We’ll gladly give you a wittier comment to this year’s WAVE once we’ve had more than four hours of sleep in a row for a change, so please make sure you join us again tomorrow. Today was in fact one of the last challenges of this year’s WAVE. 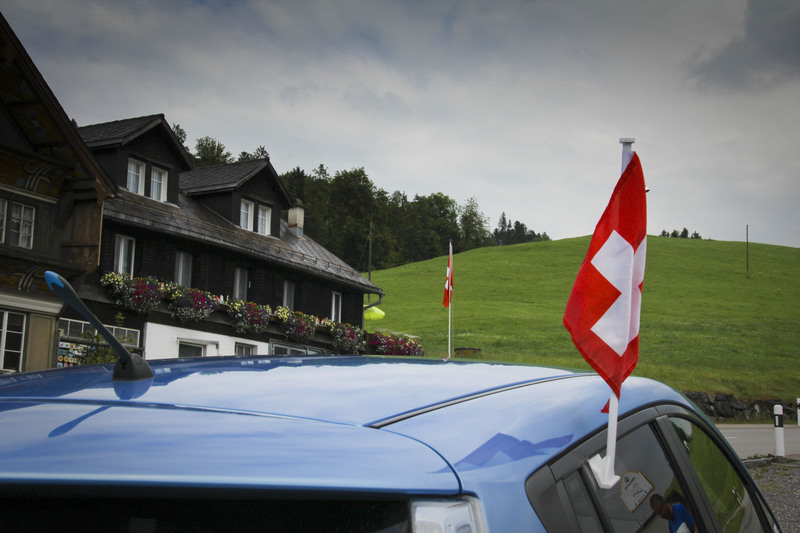 As I mentioned yesterday, we would drive a total of three mountain passes, amongst them the Stelvio, which is one of the highest mountain passes in Switzerland at 2760m / 8300 ft.
We started on time at a local school, where our cars were judged for decoration and design. There was a slight drizzle but nothing to worry about. When we started driving east, things cleared up very quickly. We stopped at Gomagoi to recharche car and crew and after coffee, we decided to (literally) pull the plug and leave. We weren’t fully charged since that’s near impossible during the day without a fast charger, but it seemed that we’d have enough to get to the top. Well, to make a long story short, we didn’t. 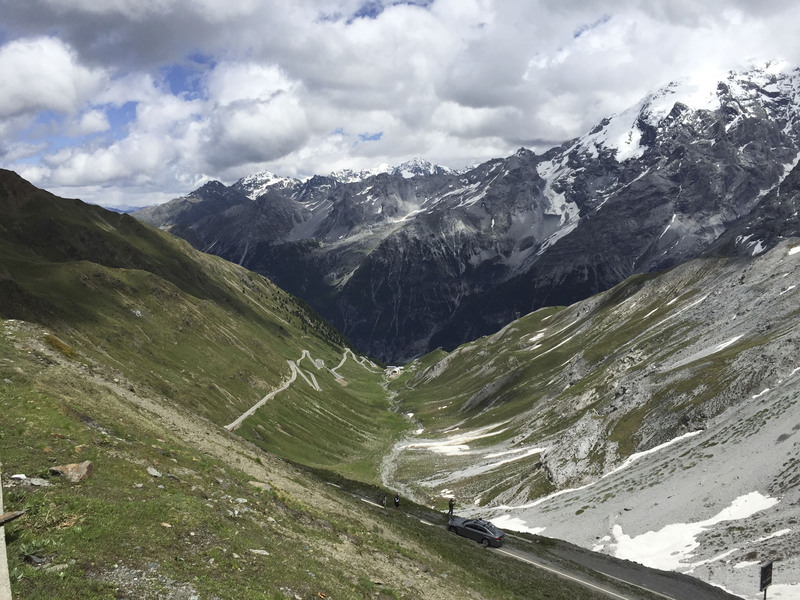 David took a rather sporty approach to the Stelvio road and that took its toll. About 400 meters from the “finish line” (the top of the pass) we got stranded with the car blinking and beeping in all directions. After the turtle mode set in, we picked the safest spot we could find to stop the car and pulled out the towing rope. It took several attempts to find the right towing vehicle, mostly because the cars we stopped didn’t have a rear towing hook. In the end, we managed to flag down team Streez and indeed, the BYD had the possibility to attach our rope. 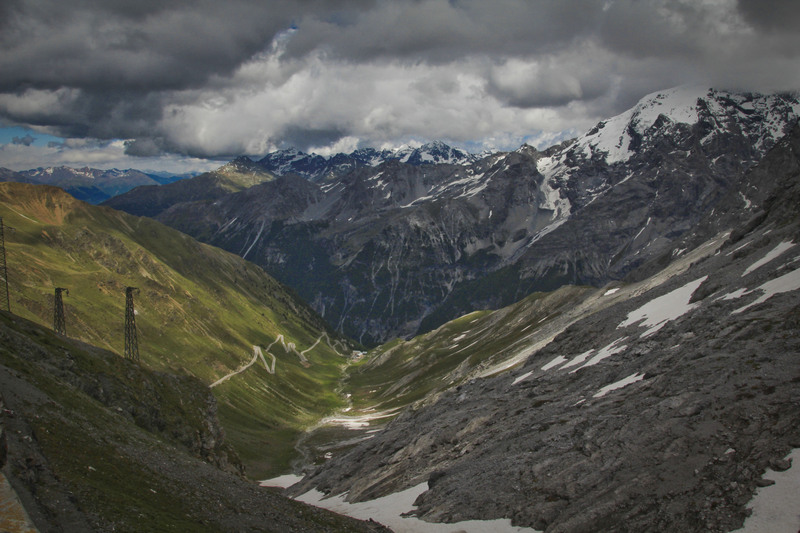 So that’s how we managed to complete the last six turns of the uppermost portion of the Stelvio road. 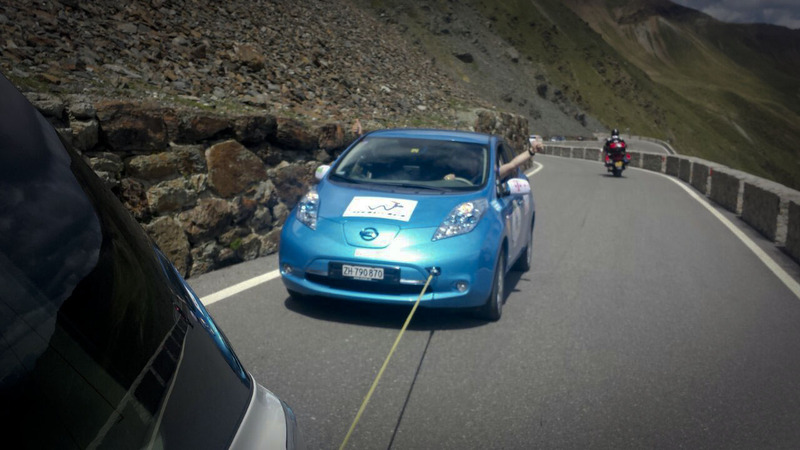 At the top, we talked the local restaurant owner into letting us plug the car into one of his 16A outlets. We charged for about half an hour, just enough to get the car functional again and left the parking lot with four kilometers of indicated range and zero bars, while the lady living inside the dashboard kept yelling at us that battery was extremely low and that we should find a charging station, pronto. 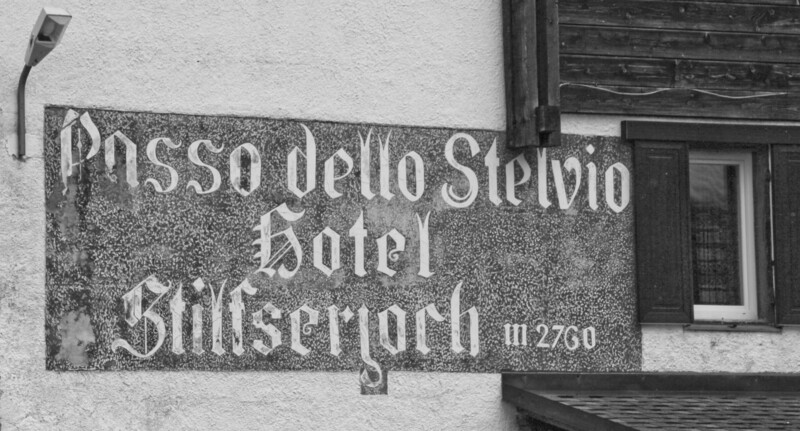 We did however take advantage of the local relief and managed to cover the distance of 74km between the Stelvio and Poschiavo, our next stop, strictly by regenerating downhill, then using that energy again to get uphill from Tirano to Poschiavo. 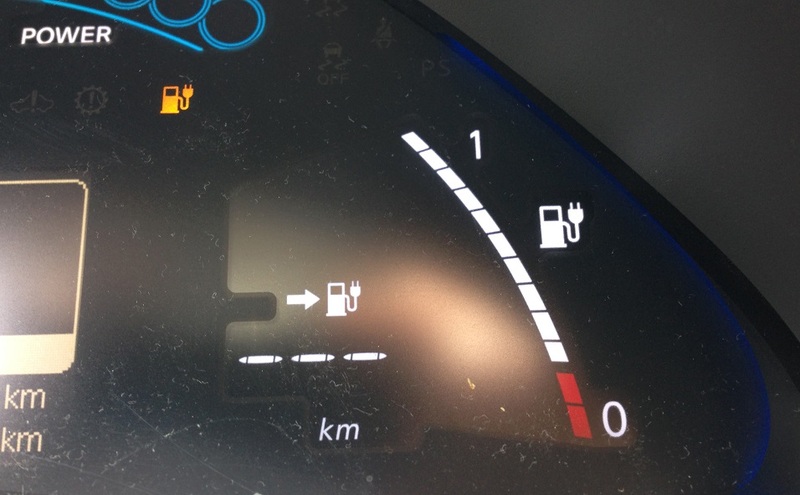 It was right on the edge, for the last five kilometers the range calculator refused to issue any statements and the lady in the dashboard got angry again. In the end, we entered the parking lot about ten seconds before the turtle mode set in – we wouldn’t have made it another mile. The tradeoff for having fun and getting stranded was that we were now stuck with no battery whatsoever and a slow charge, with just 41km to cover but another mountain pass! 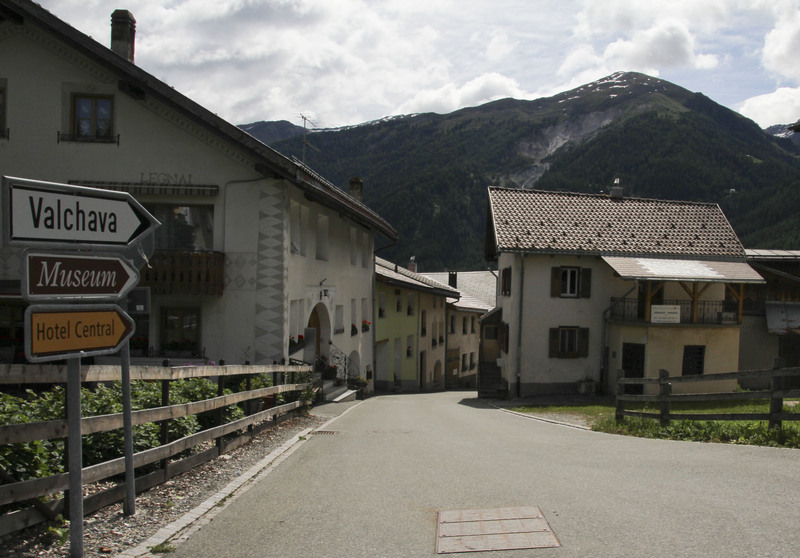 Indeed, we would have to cross the Bernina pass, yet another climb to 2330m / 7000ft. 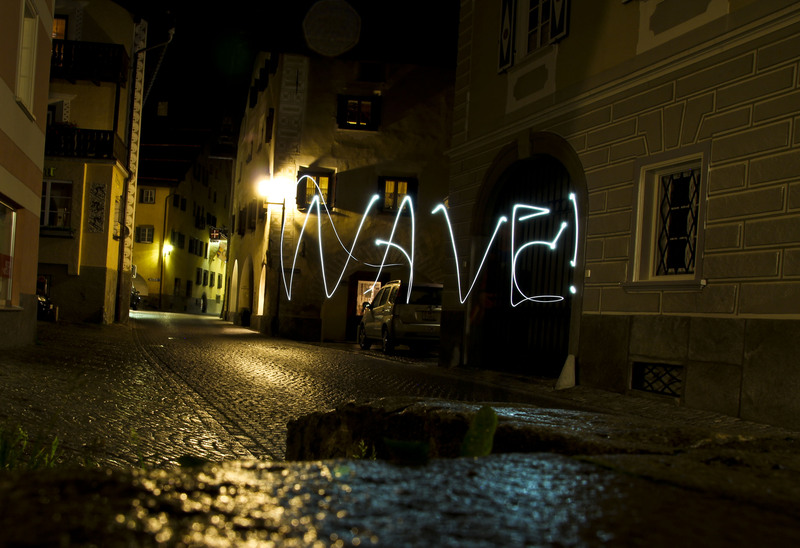 We did take advantage of that time to visit the town of Poschiavo and have dinner with other WAVE friends – stranded or not. At some point we decided that we had had enough (in terms of charging) and took off. We made it to the top without trouble and – well, getting down never seems to be a problem. Thanks again to team Streez for helping us out! You’ll find further pictures and several videos of today’s prime time event on our facebook wall. Yes, it’s my dad’s birthday today. I called him around noon but we couldn’t talk. I promised to call again in the evening. Just a short while later it’s now 11:30 pm and now would be the first moment I have to dial his number again. So instead of waking him up, here’s a little video. Bon anniversaire, Papa! And yes, by now I definitely know that I am repeating myself but this WAVE is just incredible. Yesterday’s suspicion was confirmed in that the combination of a tight schedule and steep roads will consider a challenge even though distances to cover are moderate. Today was another of those days where we need the roadbook in the evening to remind ourselves how many places we visited during the day. The first part until after lunch was a series of school presentations. 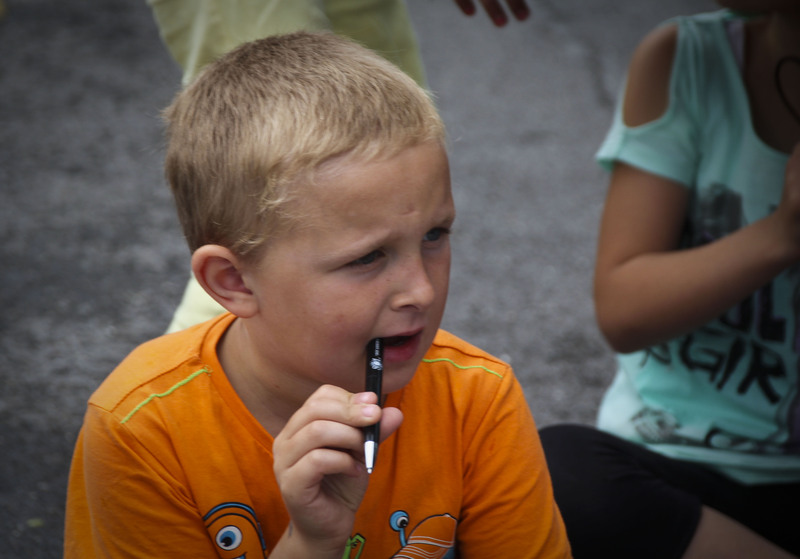 These shows are also for points – the kids judge our cars’ design and how we decorated them. 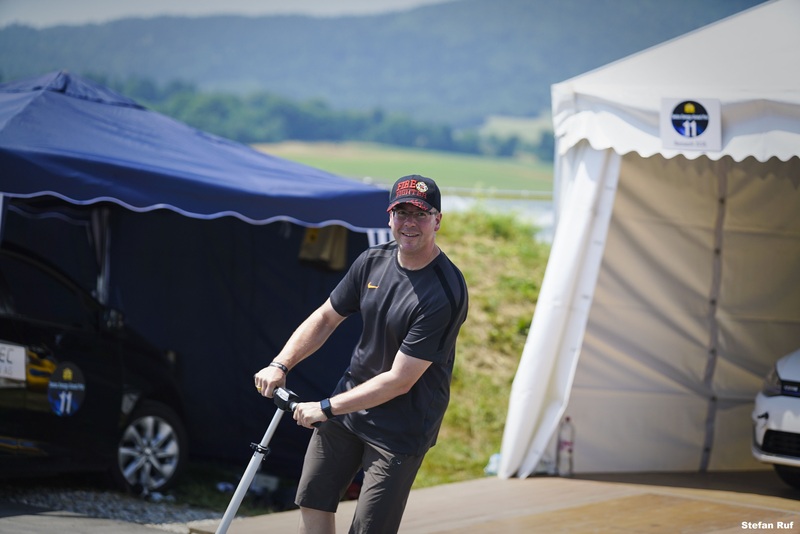 You might have heard a mystery honk on my Sachsenring youtube video – we have an undisclosed device on board that we will present tomorrow, and we hope it helped gaining the kids’ sympathies. We’re really glad these events are part of the WAVE because they are truly inspiring. 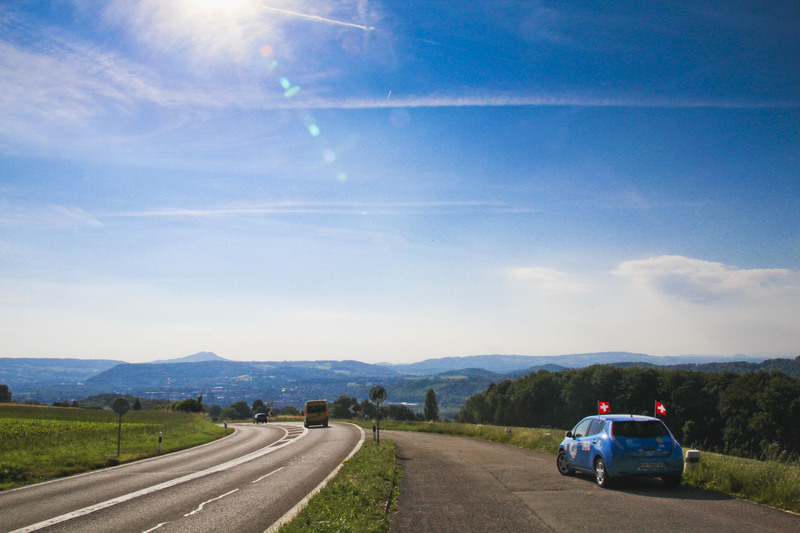 Later on, after a quick charge stop at the local Supercharger/DC charger in Maienfeld where we “accidentally” bumped into about a dozen other teams queued up to charge, we went on to Landquart, where we gave pupils a ride to Küblis. Our next stop was then in Küblis itself, we had a nice get together at the local hydroelectric power plant and were treated with an extensive visit of the whole site. 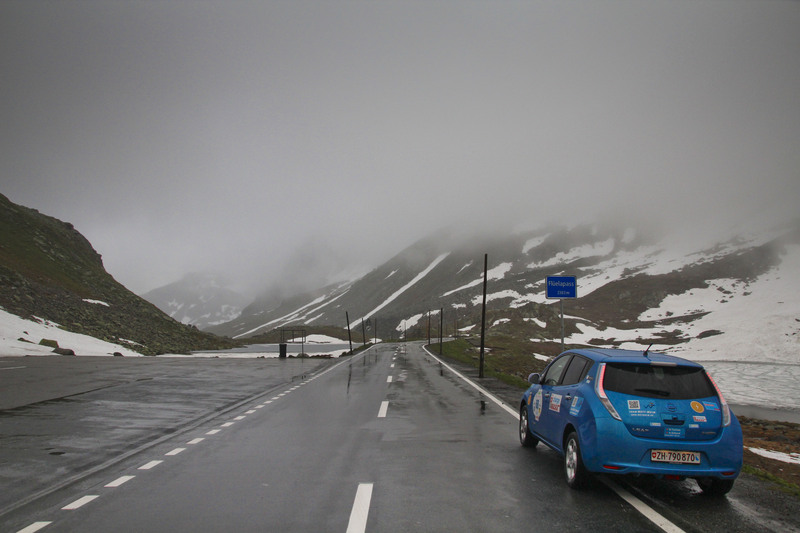 Our next stop would be Sankt Moritz – 35 kilometers away but also on the other side of the Flüela mountain pass – which meant going uphill a whopping 4500 ft. 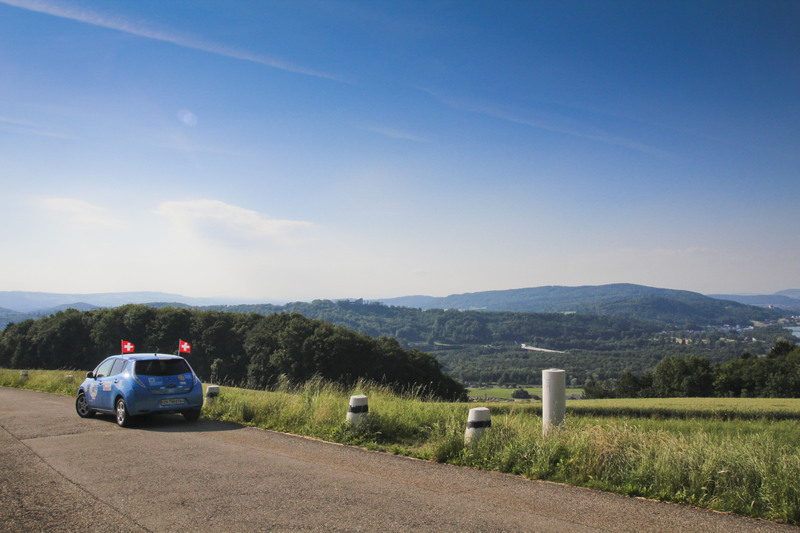 Since we were stuck with a slow charge, we were just sitting there in Küblis waiting for enough battery power to make it, when a call from Peter Schwan of Team GottliebD made it all much easier. 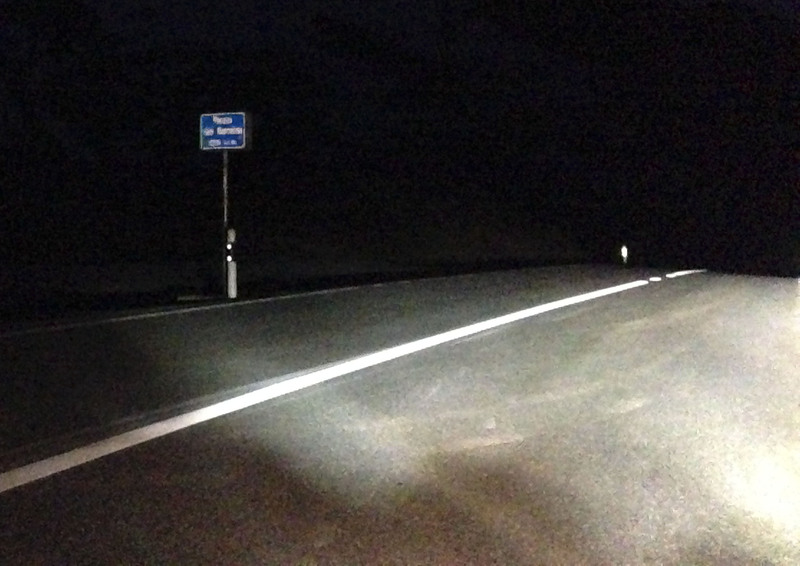 Our support team had managed to set up the mobile fast charger in Davos, which meant we could recharge right before the final stretch of the mountain pass. That was incredibly helpful…. Thank you, Peter! 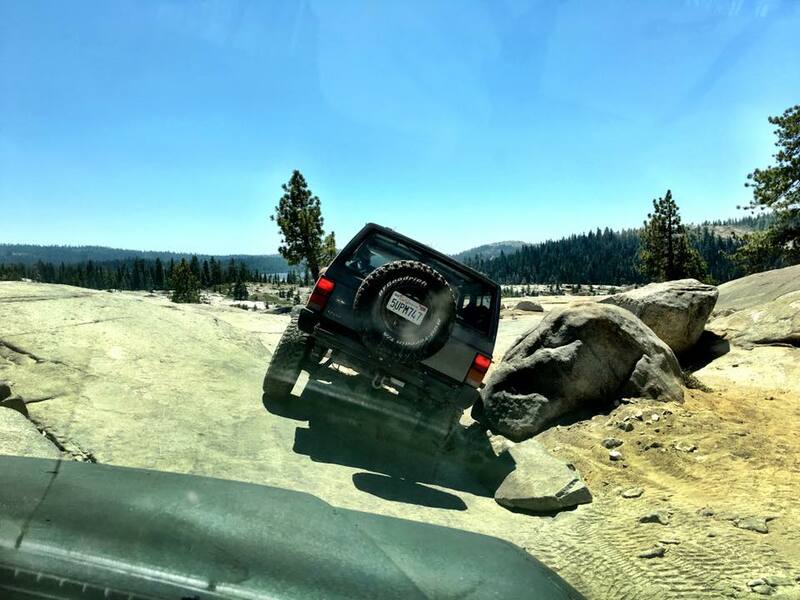 This allowed us a more comfortable drive without being a nuisance to traffic, and we even took the liberty of having a bit of fun – after all, you get your energy back on the way down. As you can see above, we made it without any problems and just stopped for a picture before we went on. Temperatures were around 4C up there in wet and grey weather so we had no reason whatsoever to stay and ran as quickly as we could. After an incredble dinner buffet in La Punt, served by the most corteous people I’ve met recently (and yes, I’m serious here), we moved on to Zuoz where we will stay in a hotel for the night. I should add that the villages around here are incredibly beautiful and visiting this area here in the summer can only be recommended. By now we are ready to crash again (we have been since about 2 pm to be honest) and look forward to tomorrow. If you think today was hard, what with the Flüela and all, well wait until you heard what we will go through tomorrow. 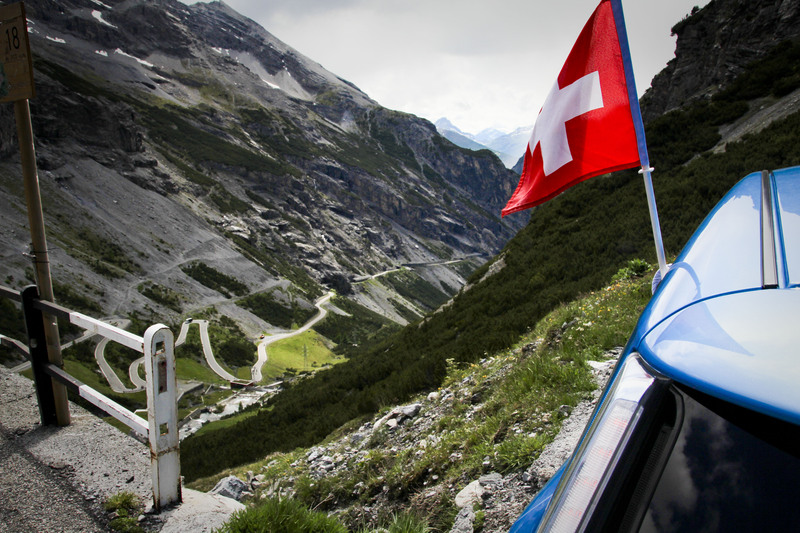 We will drive over the Stelvio Pass and the Bernina Pass. 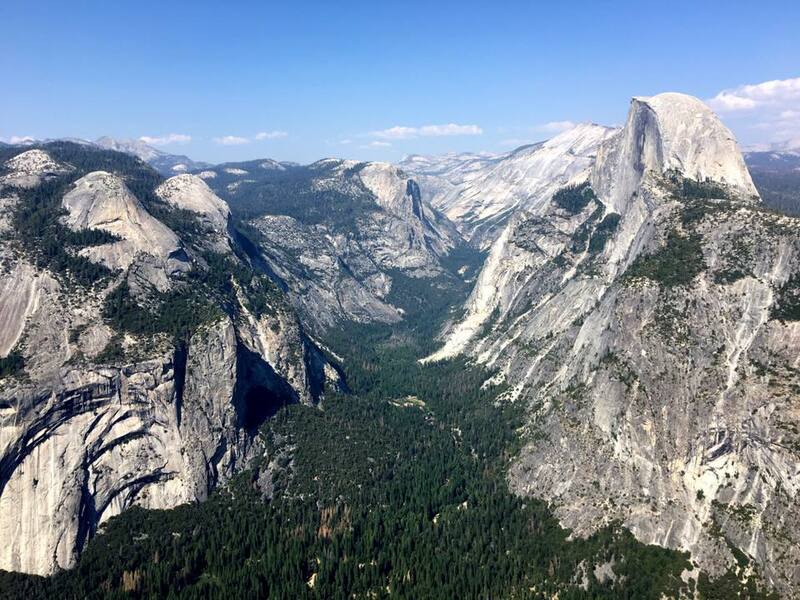 We are talking about a total of around 15,000 ft of elevation to climb! We thought the Berlin-Switzerland rush was a challenge but I think tomorrow will be similar. Please note that I only use previously unpublished pictures in our blog. For pics and updates of our past and future adventures, I’ll have to refer you to our facebook page yet again. You want the WAVE? You can’t handle the WAVE! At the risk of repeating myself, I have to say that this year’s WAVE is much more demanding than last year’s. Perhaps it’s just the aftermath of the marathon we covered in the last two days but batteries are low – figuratively speaking. just a figure of speech, honest. However, since we now completed those days with the long distance travel, things are ever so slightly more relaxed. Still, between our limited range and the need/wish for fast charging, we do end up having very long days. Today, we visited several schools in the morning to present our cars. These still are amidst our favorite moments, showing our cars to the kids and perhaps giving them ideas… who knows what the future will bring. Later, we visited a nuclear power plant and had an interesting insight into the oldest running nuclear reactor in the world – well, not an insight into the reactor but into its operation. (rimshot) We do have a very tight schedule these days, and we did manage to follow it minute by minute. So, no delays, Wattwurm was always on time. A-L-W-A-Y-S. (I just wanna make sure the jury sees this). 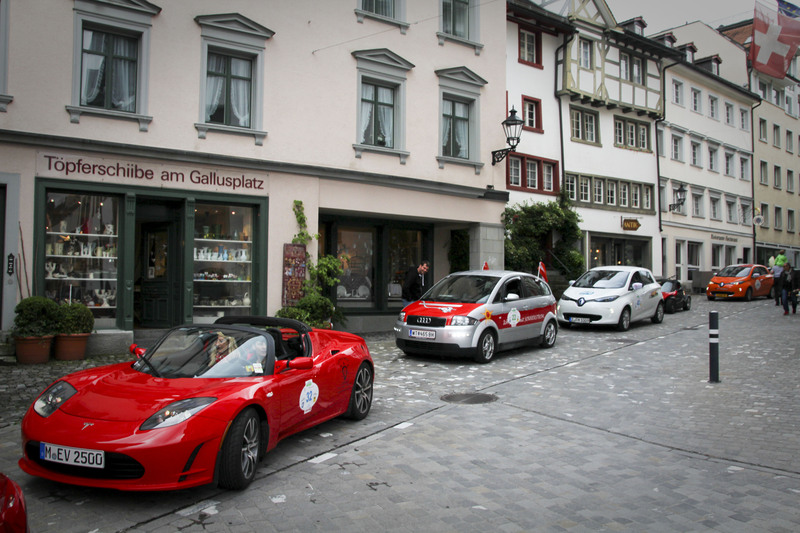 In the afternoon we presented our car in front of the railway station in Aarau, from which we moved on to Baden where ABB was hosting a mobility day. Unfortunately we did not have a chance to really enjoy that event since we had to attend the briefing which ended up lasting a bit longer than expected. We did however manage to reconnect with a few WAVE friends from 2014 who came all the way to Baden just to see us. Thank you! Tomorrow, more schools. 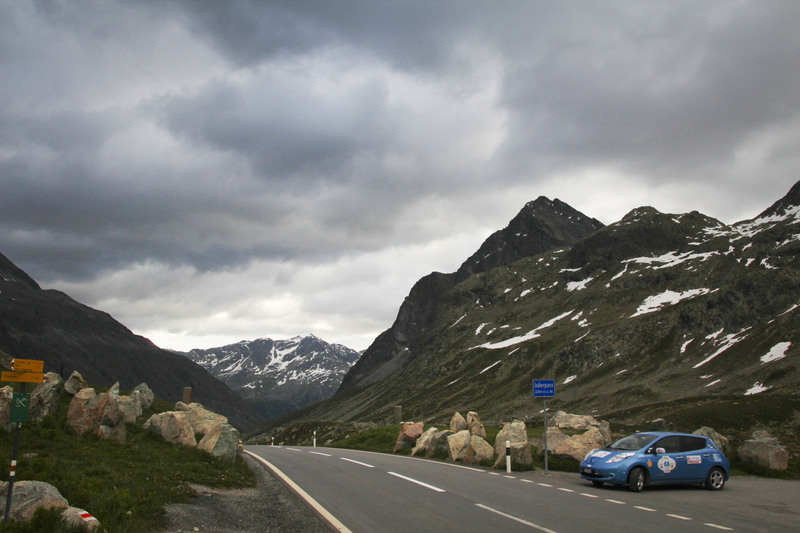 The challenging bit will be the fact that we will be driving into the mountains. So stay tuned, our adventures aren’t over just yet! lychtenstyn on Scenic, isn’t it? Florence on Scenic, isn’t it?